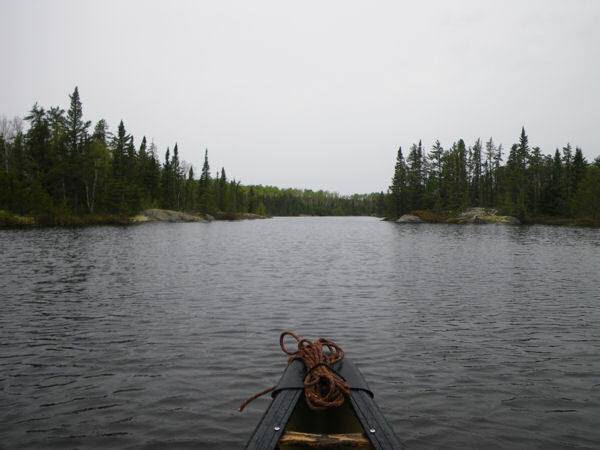 This spring our canoe trip took us to Pickle lake, Ontario. 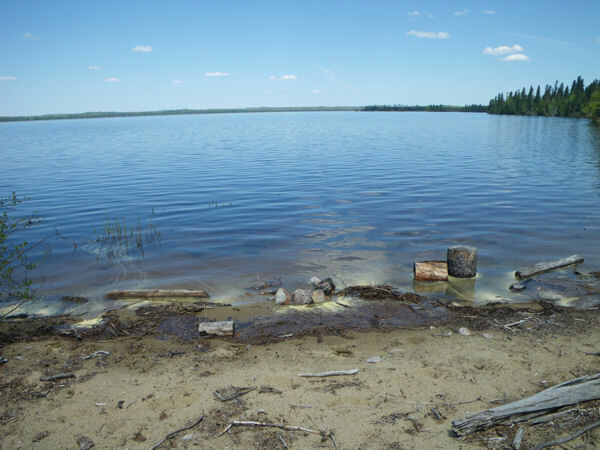 Pickle Lake is small town (about 300 people), and is the northern most town you can drive to in Ontario. 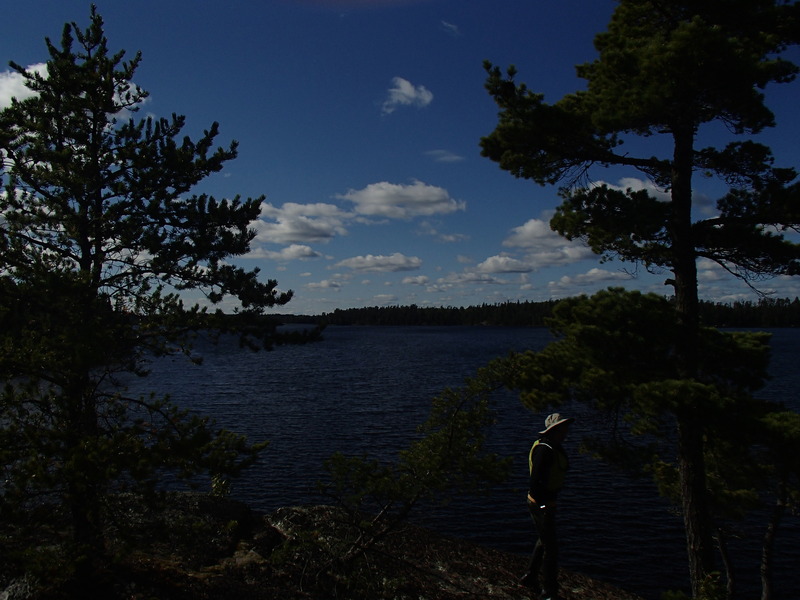 Our route started at Stirland Lake, a 120 mile drive on the north rd from pickle lake, and ended at Mud Lake, about 20 miles out of town. 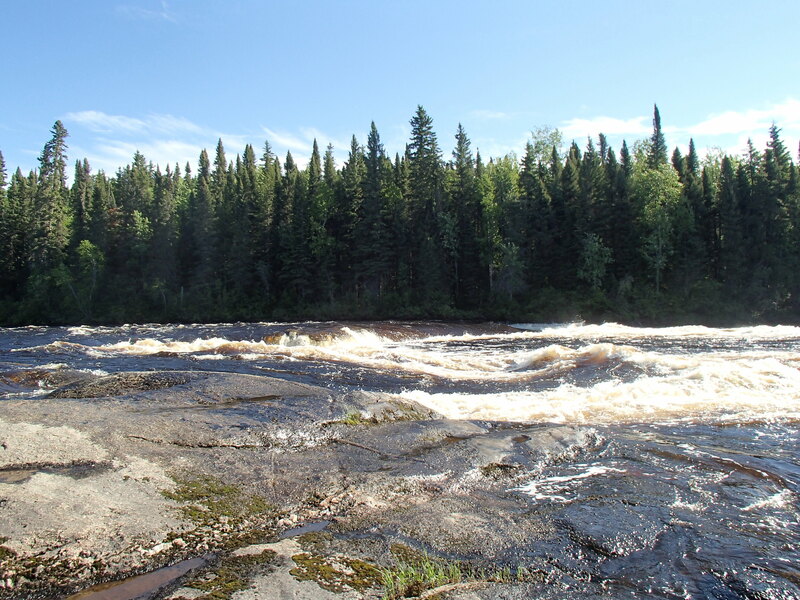 On the drive to Pickle lake we crossed over Rat Rapids, the starting point for the Albany river where centuries ago my parents started their trip to James bay. We put in at Stirland lake after a long drive. We had missed the put in the first time, over shooting it by about 10 miles. This seemed a bigger deal at the time as the 240 mile round trip is very near the limit of a full tank of gas in my truck. I did have an extra 5 gal., but I could just imagine our pour shuttle driver stuck with an empty tank 40 miles from town. 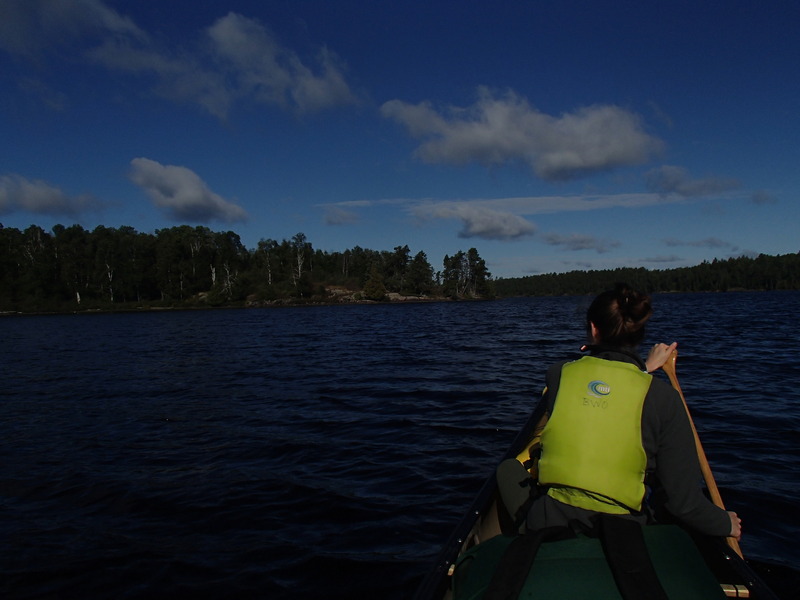 We paddled across Stirland lake to our first portage, which crossed an island with rapids on either side. 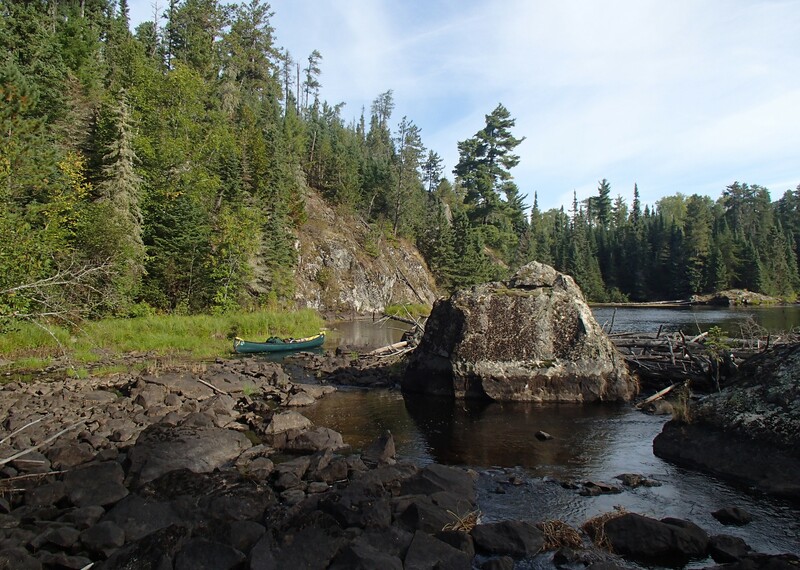 There was a wonderful campsite at the end of the portage, and had we covered more than 2 miles, I might have stopped. 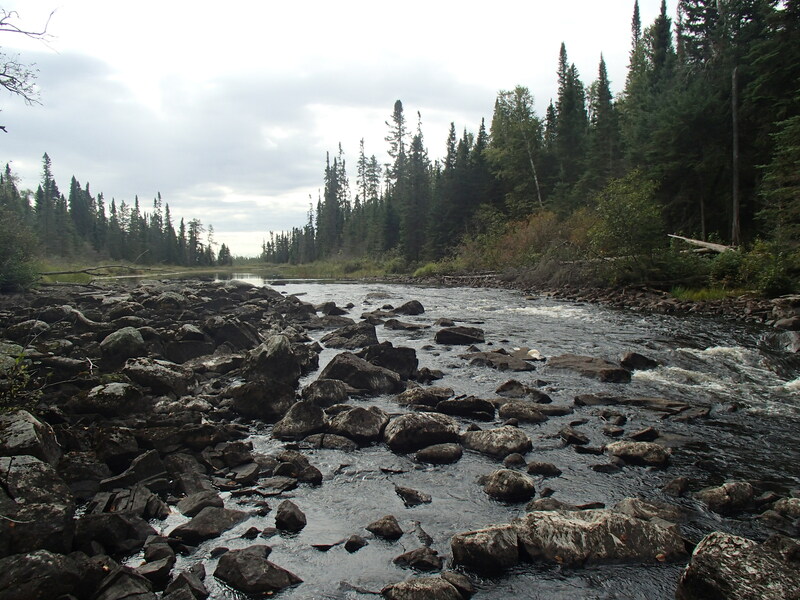 The North Pipestone continued this pattern of slow lake like sections separated by short shallow rapids. 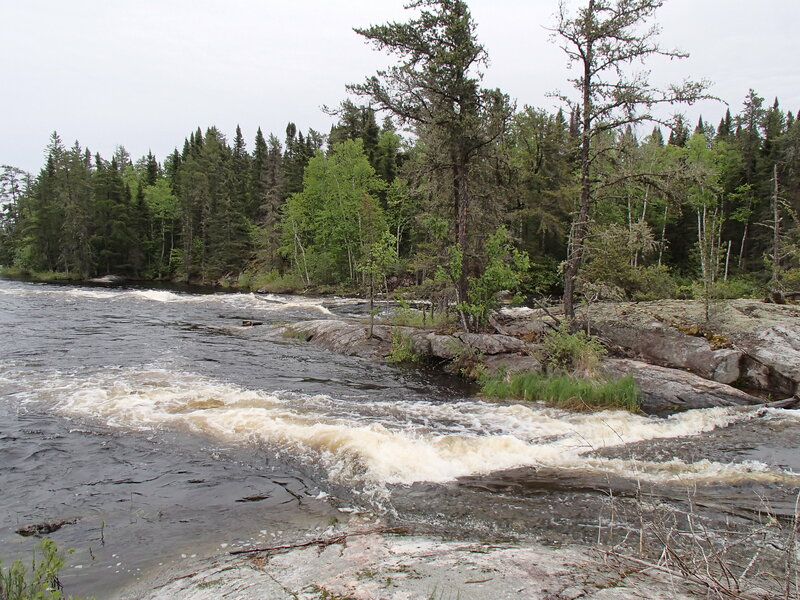 Most of the rapids didn’t seem runnable, either too rocky or ending in a shallow ledge. 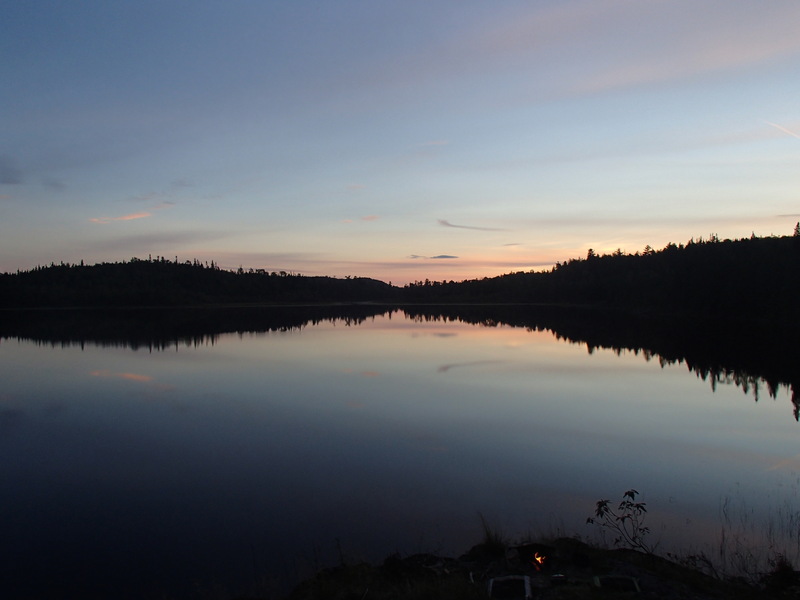 We passed many beautiful places to camp, but unfortunately stopped seeing them around the time we would normally stop. 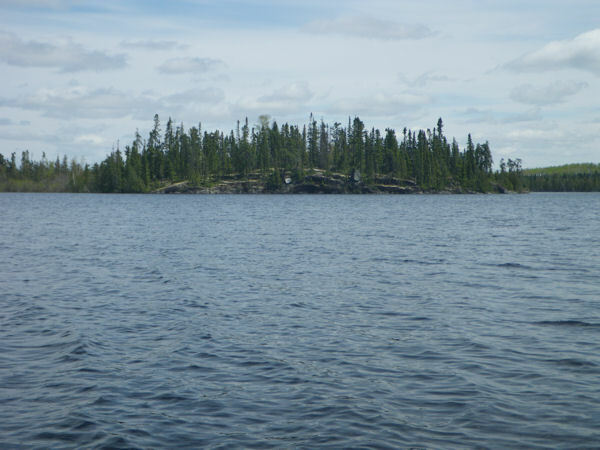 We paddled on and ended up on a nice wooded island on Sasiginaga lake. 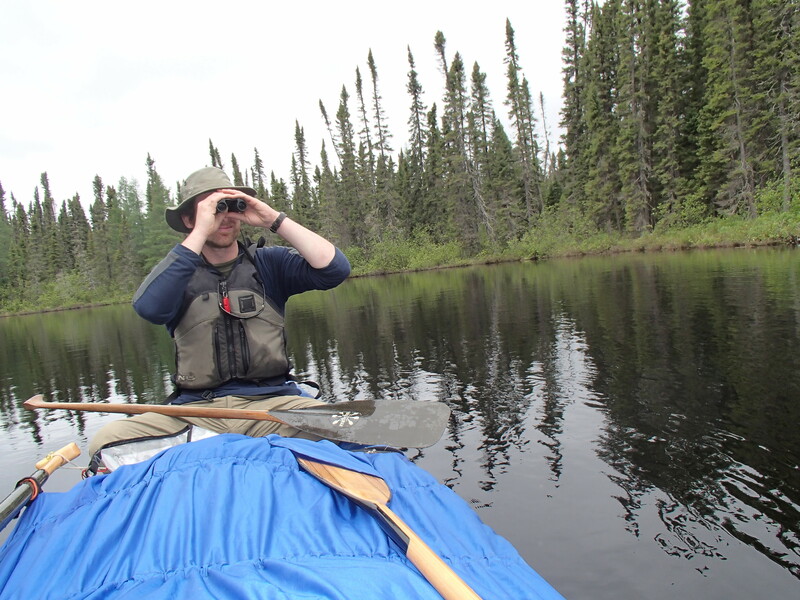 During the day we saw a moose, eight otters (including a group a seven) and a whole bunch of eagles. 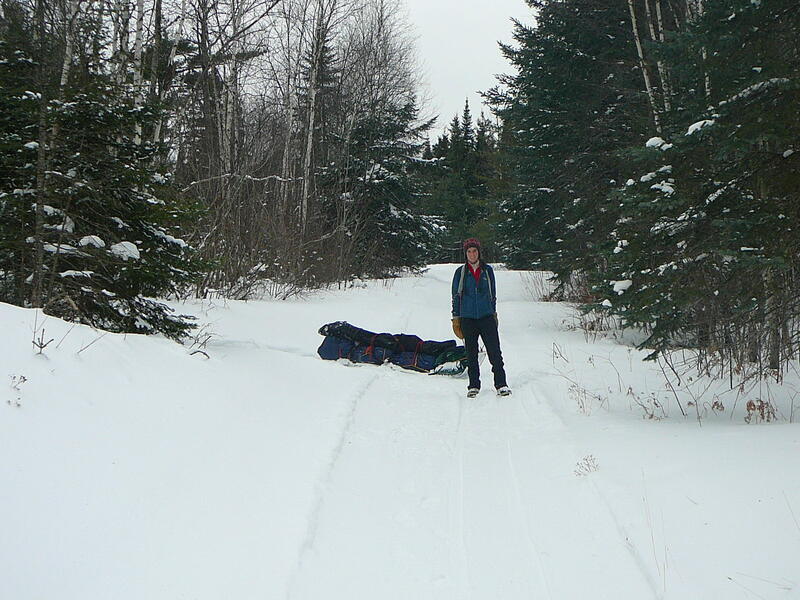 Our second day saw the end of the N. Pipestone, and our ascent on the Morris. 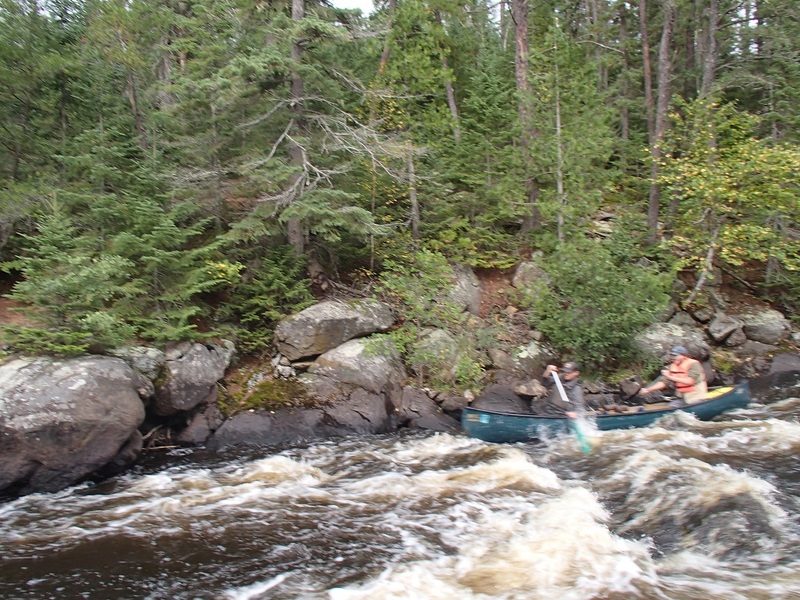 The North Pipestone finished as it started, with short rapids and big rocks. 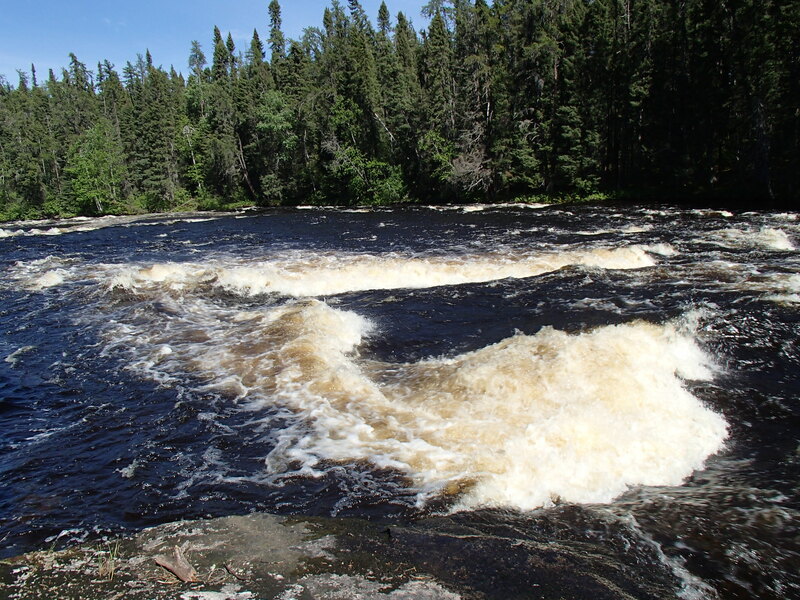 More of the rapids were runnable. 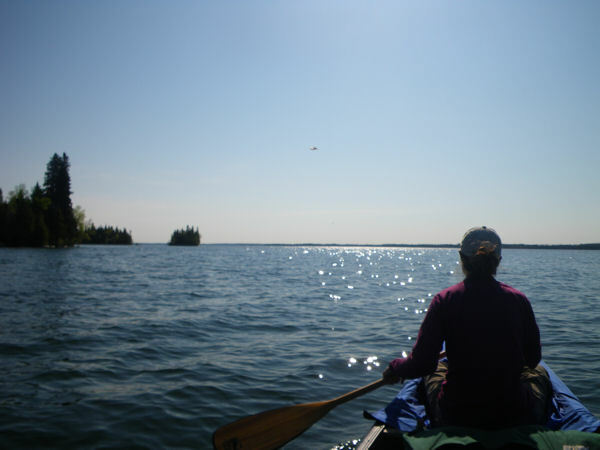 We paddled across Kecheokagan Lake in a dead calm with the sun beating down on us. 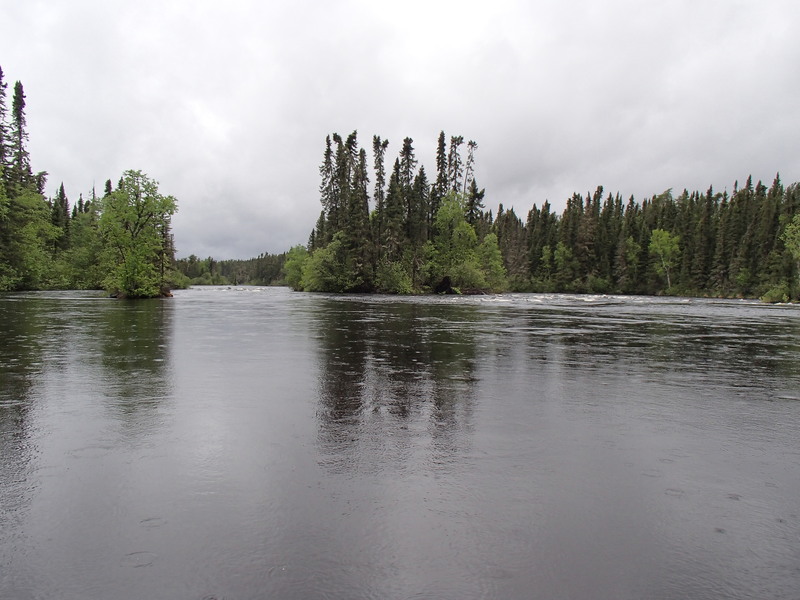 Kecheokagan Lake is the end of both the N. Pipestone, and the Morris River, while the Pipestone itself flows through on its way to the Winisk River and Hudson Bay. We reached the Morris, and began to paddle upstream. Travel was fairly easy, with little current in most sections, broken up by large rapids or small falls. The first two portages, although short, were challenging. 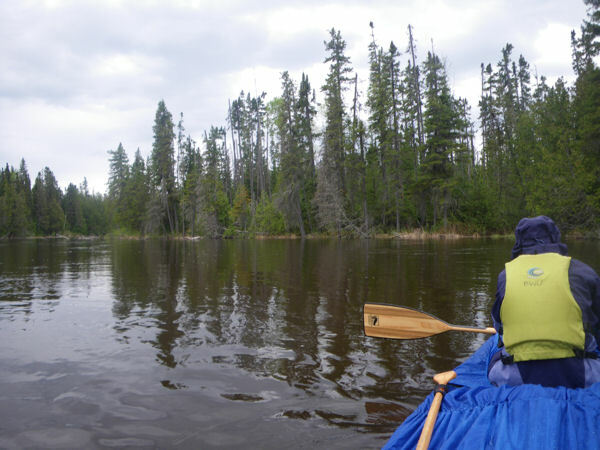 The second portage especially consisted primarily of sections of either shallow swamp, or a crisscross of knee to waist high fallen spruce. In between these were sections of fallen spruce crisscrossing shallow swamp. 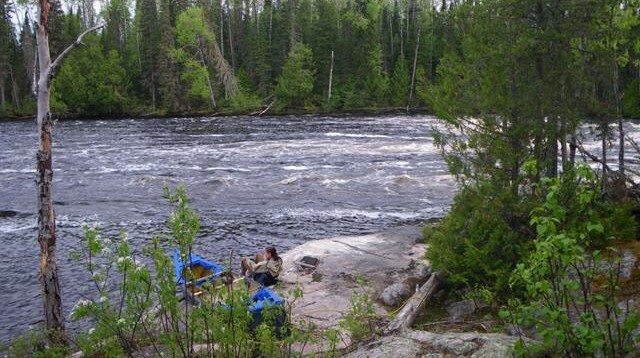 We made camp at a nice site on the third portage, next to a powerful rapids. On day three we continued up the Morris. The Morris widened, and was often more like a lake than river. In narrow parts the current increased, and we often had to paddle up small swifts. 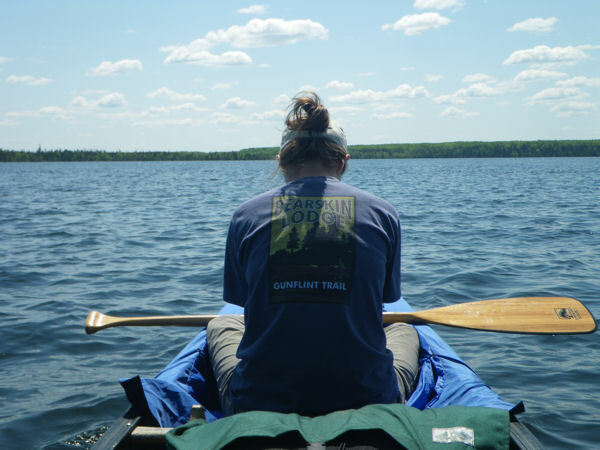 We portaged only once, and paddled straight into Kinloch lake. Along the way we had to stop and stretch our legs, something portaging usually takes care of. 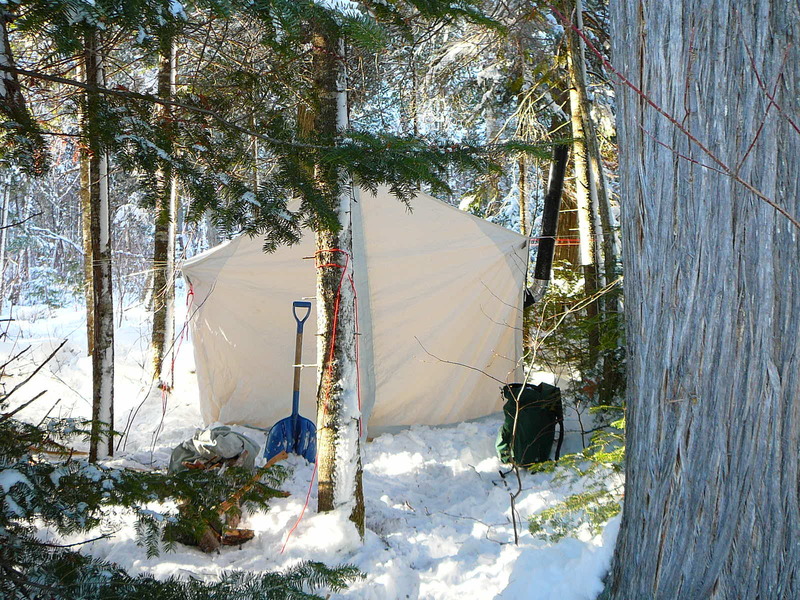 At one stop we pulled up to a nice rock and found two tent frames made of cut spruce. 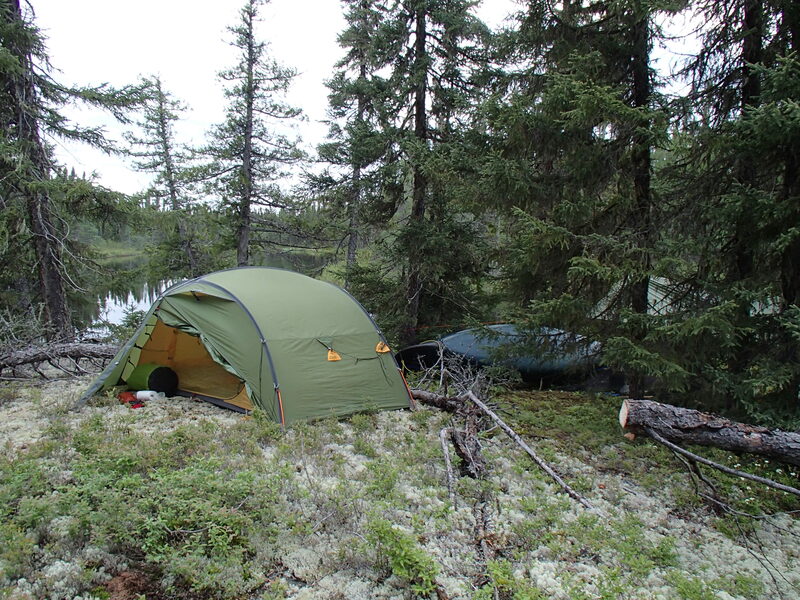 The framing was well done, and it looked like a nice place for an extended camp. Entering Kinloch we found a long lake filled with deep bays and islands. 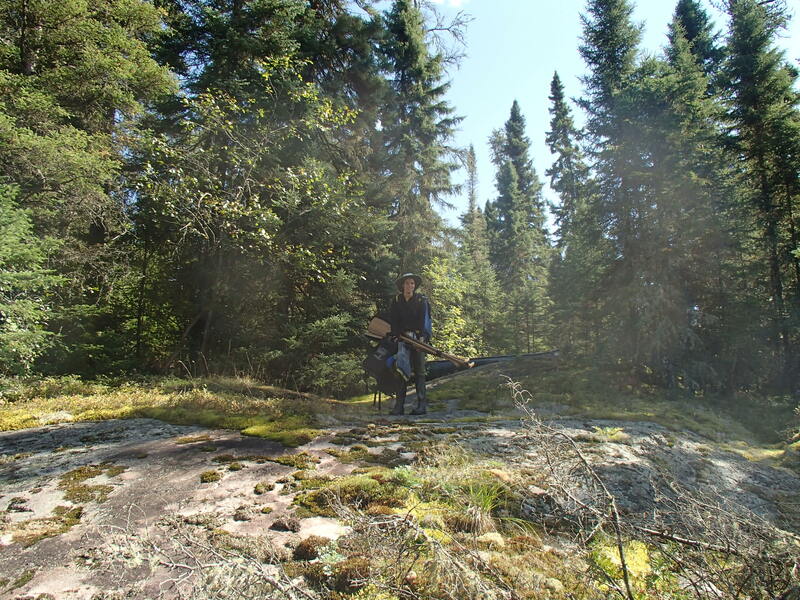 We made camp on a very nice large rock about a third of the way down. 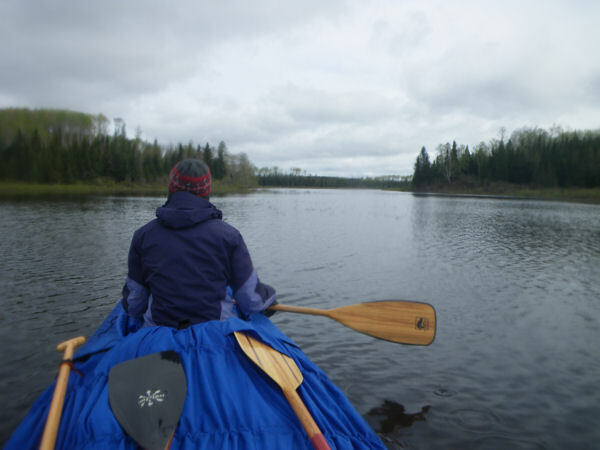 On day 4 we faced the possibility of a no portage day. 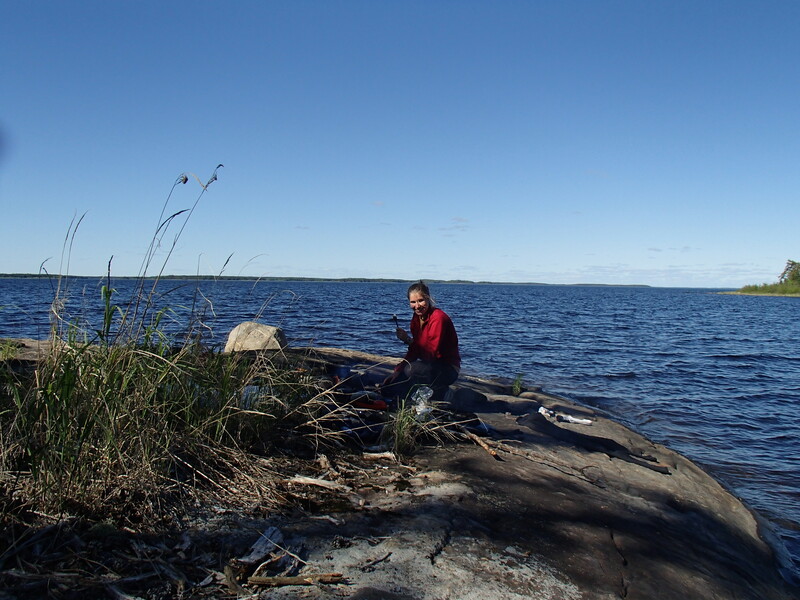 We had a good deal of Kinloch to cover, and then two smaller but long lakes in Obabika and Otonoobe. 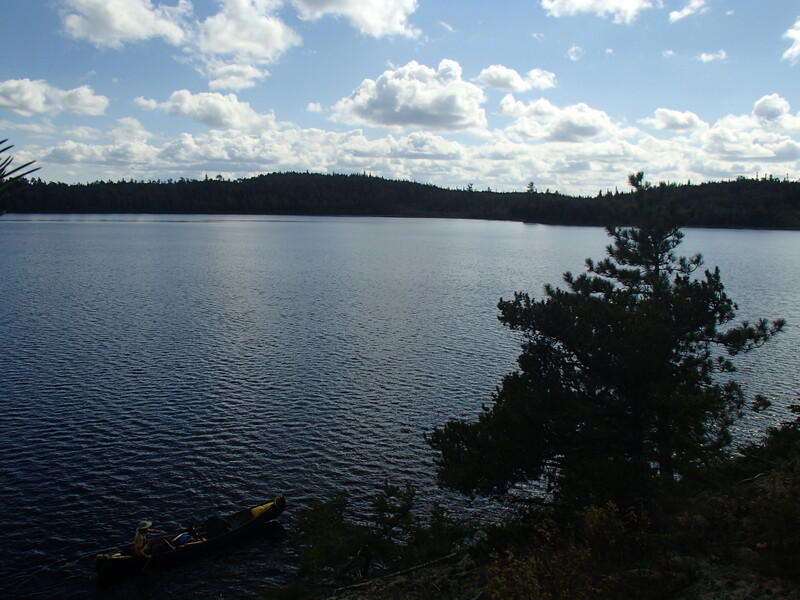 At the end of these lakes we would portage over a long height of land portage into Williams lake, the largest lake on our route. From that point on, the water below us would be flowing into James, not Hudson bay. The day was again very hot, and we took stretch breaks every 1 ½ to 2 hours. 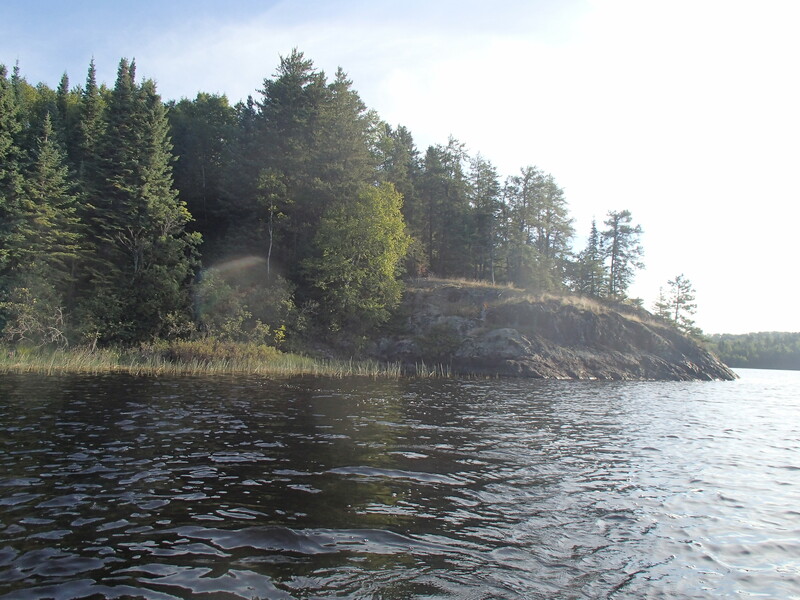 At a narrows on Kinloch, we were treated to a Moose approaching the water and swimming to the other side. On Obabika we saw a group of five otters sprint onto shore from the water, only to re-emerge a minute later chasing each other into the lake. We stopped for lunch on a shaded island. 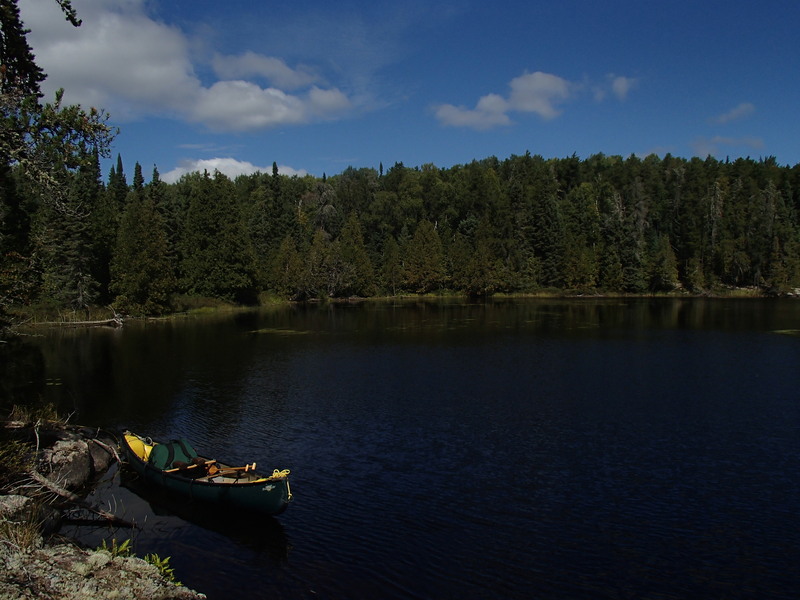 The chance of not portaging all day was now gone, since we were very close to the height of land portage. 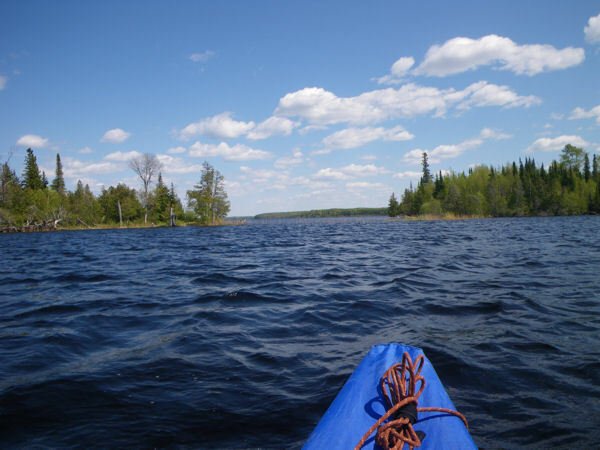 We were ready to stretch our legs, and wondered what kind of shape the portage would be in. It turned out to be ok, with mostly good footing and just clusters of downed trees blocking the path. We took a couple short breaks, but made it across to Williams without much trouble. 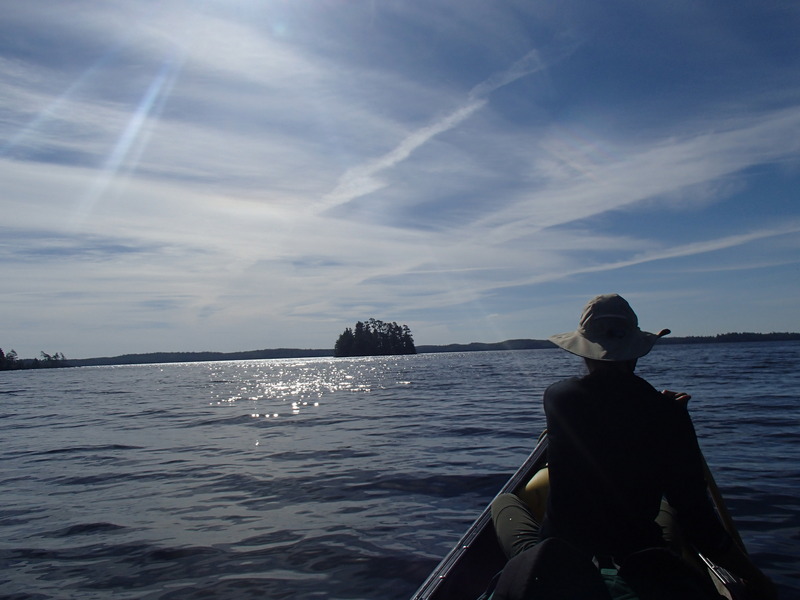 We paddled out from a narrow bay on Williams into a large section of the lake, and made our way to a cluster of island where we found an excellent campsite. We swam for the third day in a row. 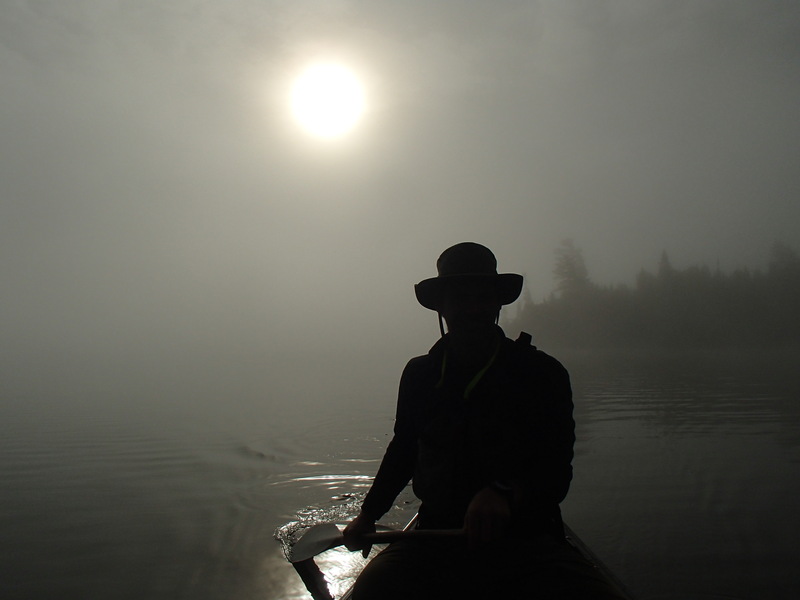 Day five started with a long paddle on Williams lake. 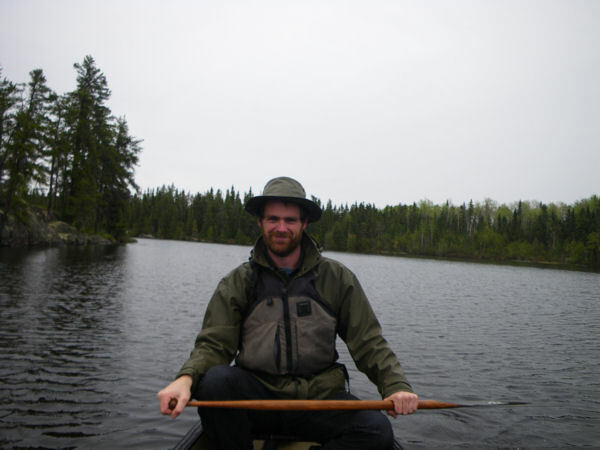 This was the only lake we were on that was more of a circle than long and narrow shaped, but a large peninsula in the middle of the lake made it so we had to paddle much of the shore line and not cut across the lake. The morning was still and scenic with many rock islands. 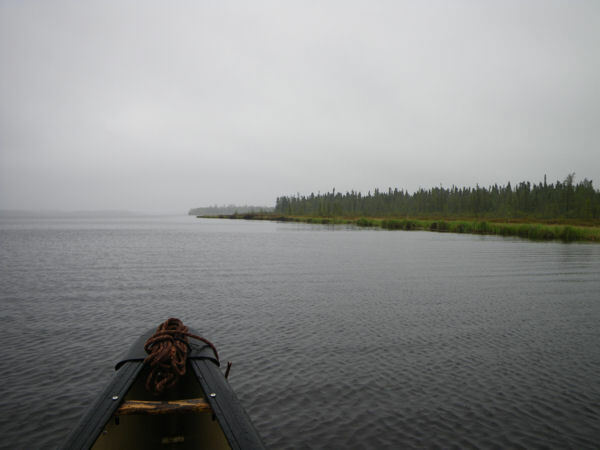 As we approached the long bay the lead to the Williams river, we heard the sound of an outboard and soon saw the only group of people we would see on the trip. Two motor boats stopped and talked to us, probably more surprised to see us then us them. A bit farther down the lake we passed the fly in outpost they were staying at. 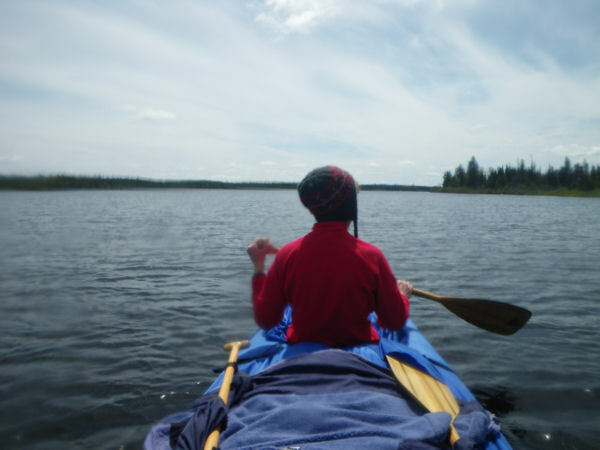 We paddled off of Williams Lake, and started down the Williams river. 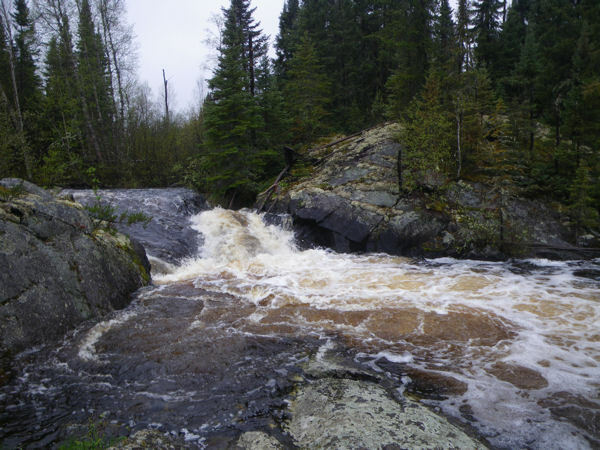 The Williams River was a small water way with many short sections of rapids. Some were runnable, others too shallow or made too dangerous by low over hanging trees. 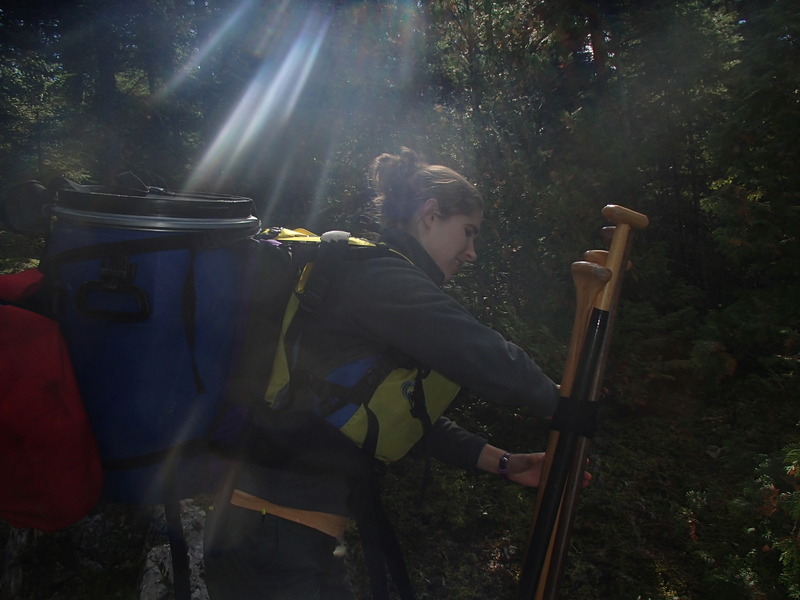 We scouted everything we ran, and sometimes were able to eddy out after the start of the rapids and shorten the portage. 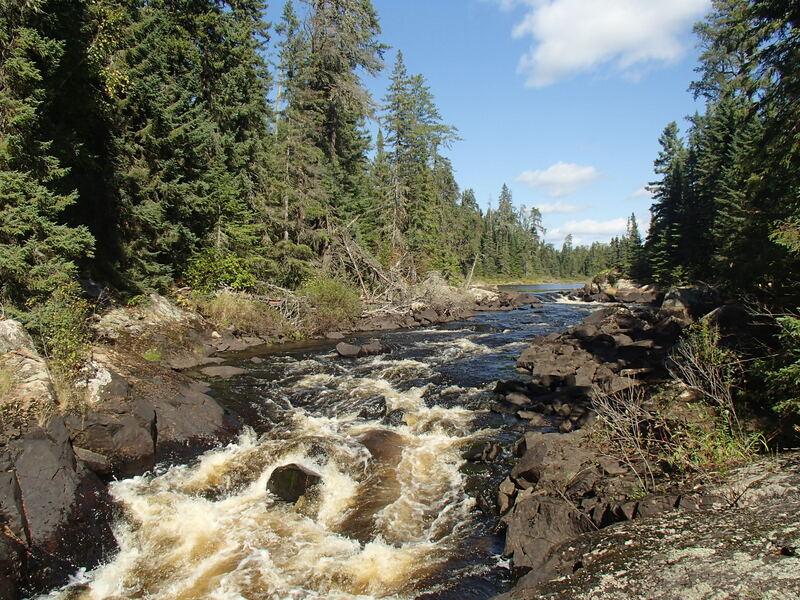 The portage around the longest set of rapids was in the worst shape, but most were pleasant walks through fairly open spruce forest. 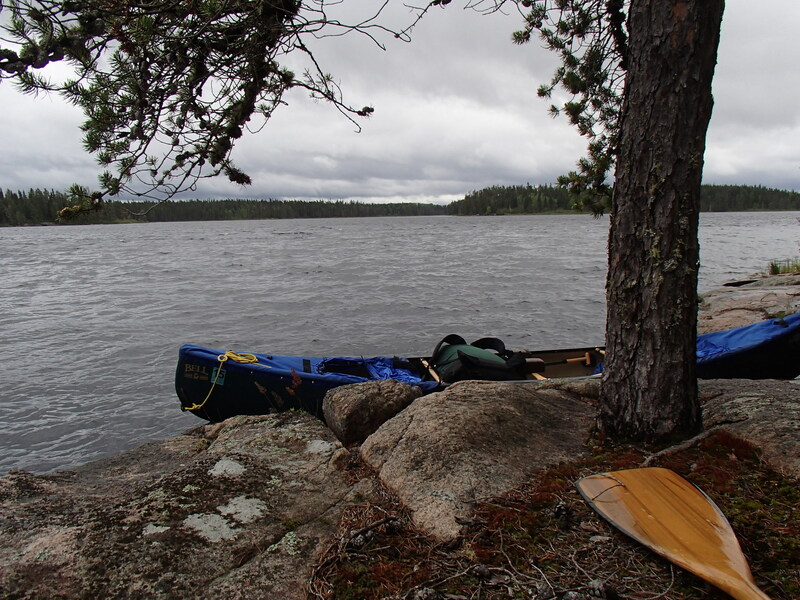 Near the end of the day we paddled in a very brief but very hard down pour, before making camp on an island on Otoskwin Lake. Day six started our descent of the Otoswin River. 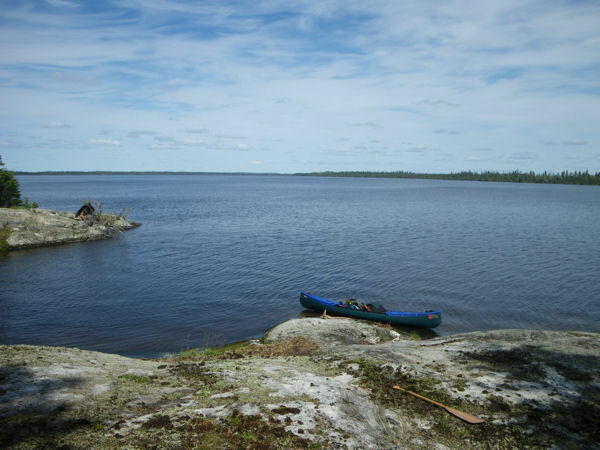 We paddled the length of Otoskwin Lake, one of the nicest lakes of the trip, and soon were at the portage around long current rapids. 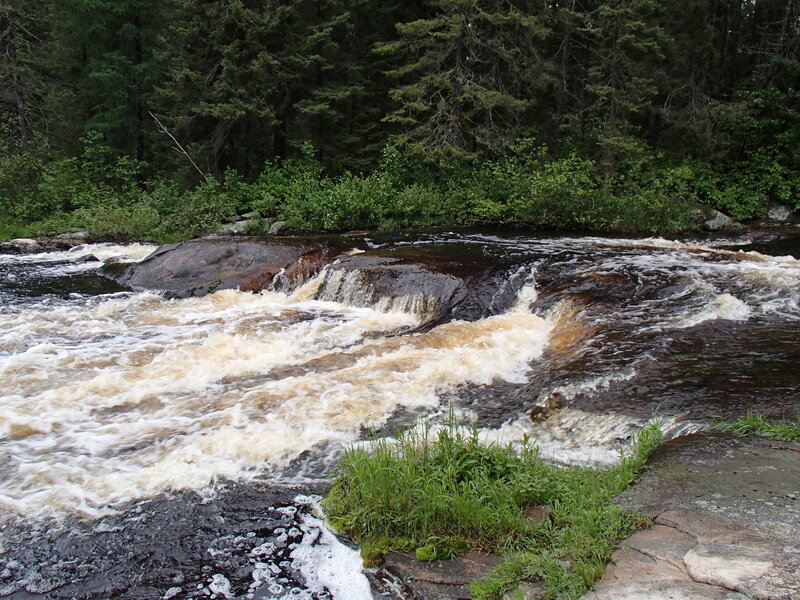 The rapids had a lot of water, and looked like they were probably beyond the limits of what we would run on a trip. 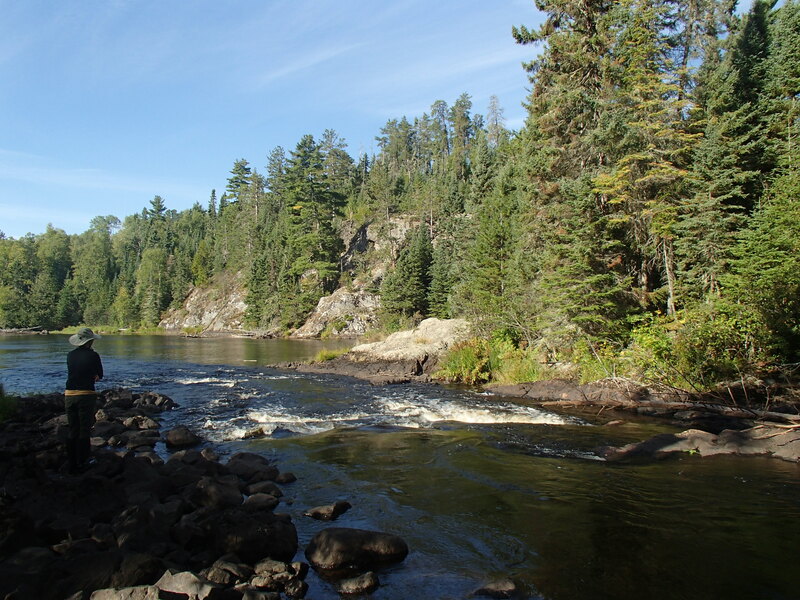 The portage veered away from the river after a while, and the sheer length of the rapids made scouting the whole thing impractical. 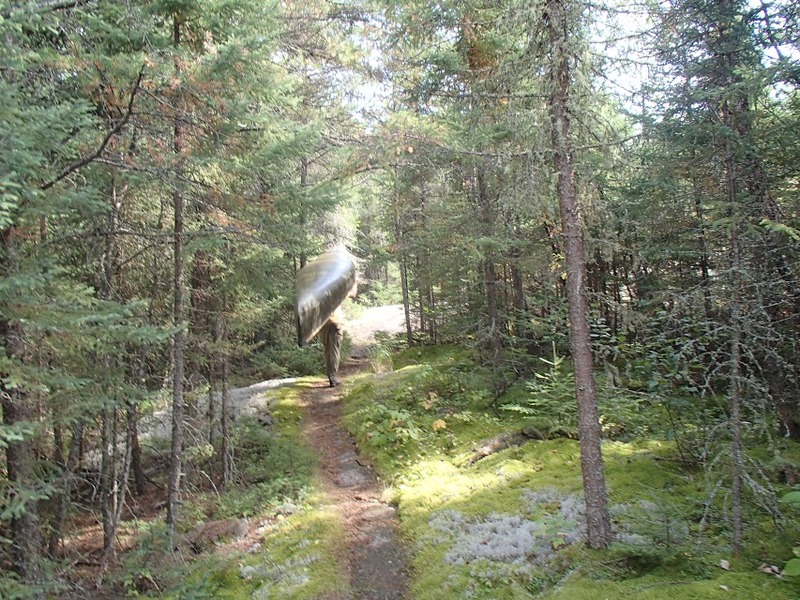 We took the 1600m portage, and found it an easy walk, with good footing and few obstructions. We took a short break at the bottom of the rapids and then carried on our way. 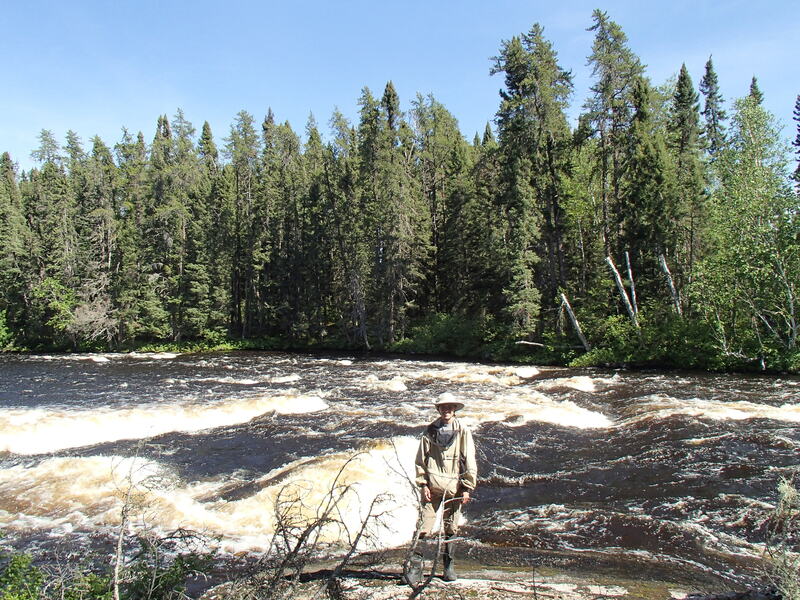 After making our way down Froats Lake, we hit the junction of the Dobie and Otoskwin rivers. Although there were only small swifts, the power and current of the river were evident. Our next stop was a longer set of rapids above Bow Lake. We took a long time scouting these, and eventually lined down river right for a bit, then paddled an easy sneak route down the right side. To the left of our route there was a massive ledge booming away. 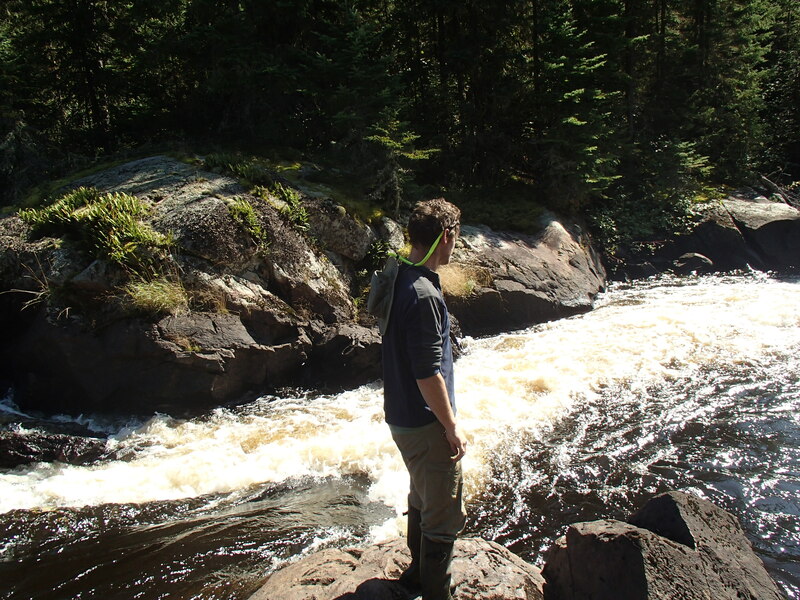 We had taken a long time scouting, and decided to stop for the night on a nice rock formation next to the rapids. 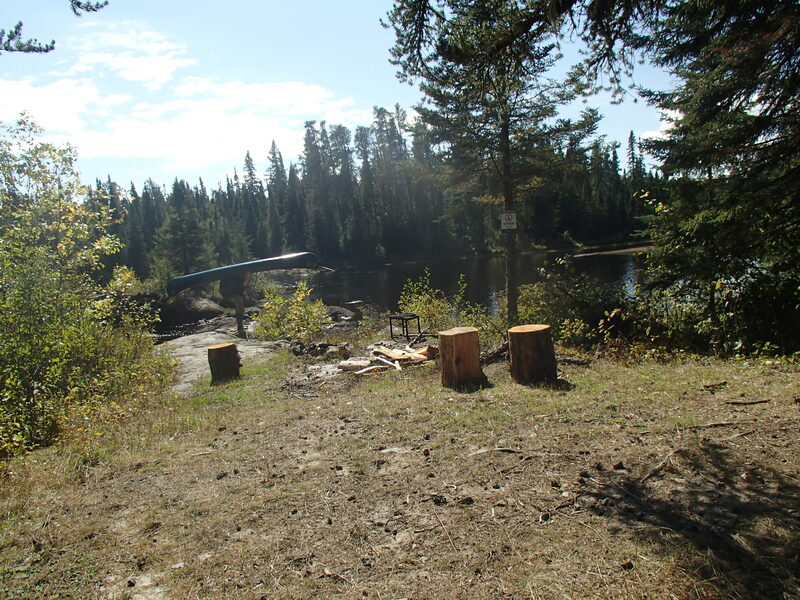 While very pretty, the site did need some work, and dead-fall had to be removed for a tent pad. Our seventh day was our lone day of bad weather. We woke up to a light rain, and it continued for most of the day. 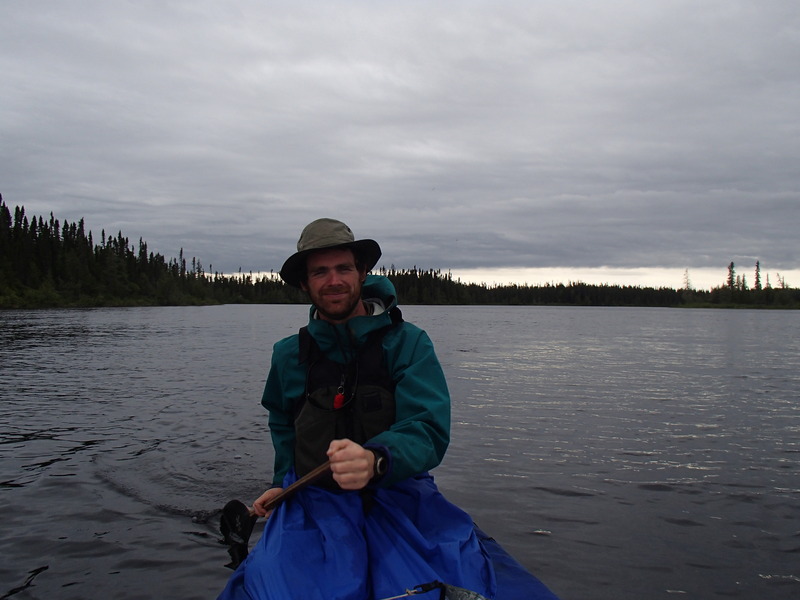 We had a very strong headwind on Bow Lake which made for slow going. After Bow Lake the rapids were very fun, easy lines with huge waves. We portaged once, around a giant V in the middle of a rapid. We put our canoe in inside the eddy below the drop and were surprised to see that the upstream current created by the eddy was making a small rapids flowing upstream. We ran the rest of the rapids and were on our way. 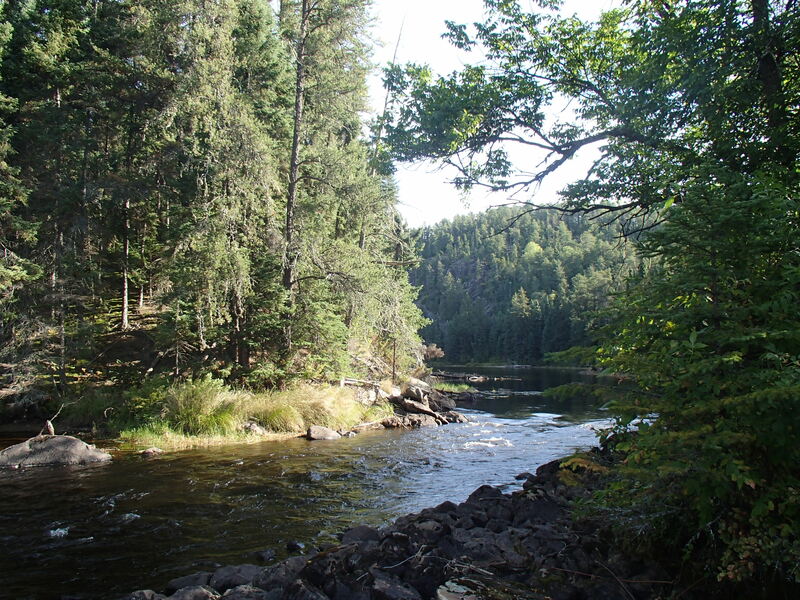 Eventually the river lost its gradient, and the banks became lower and less rocky. 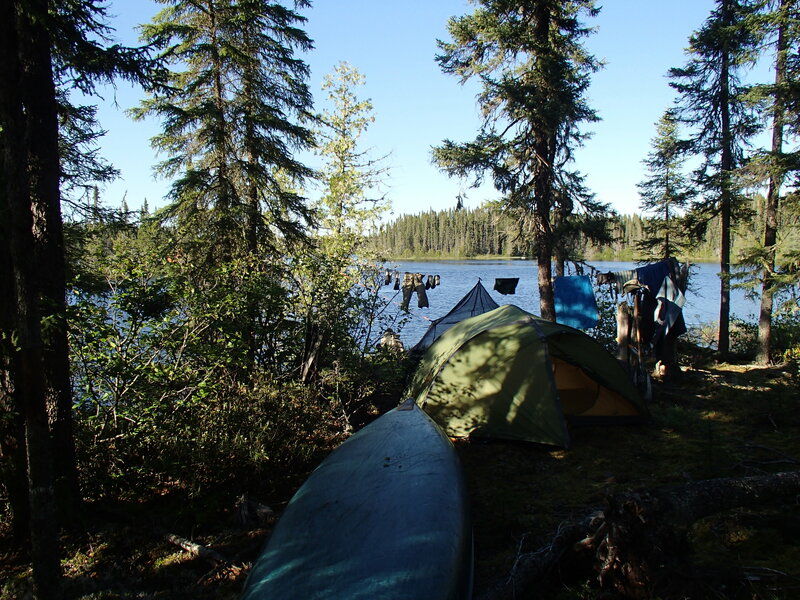 We continued on in the rain, and stopped for the night at the last rapids before our take out at Mud Lake. 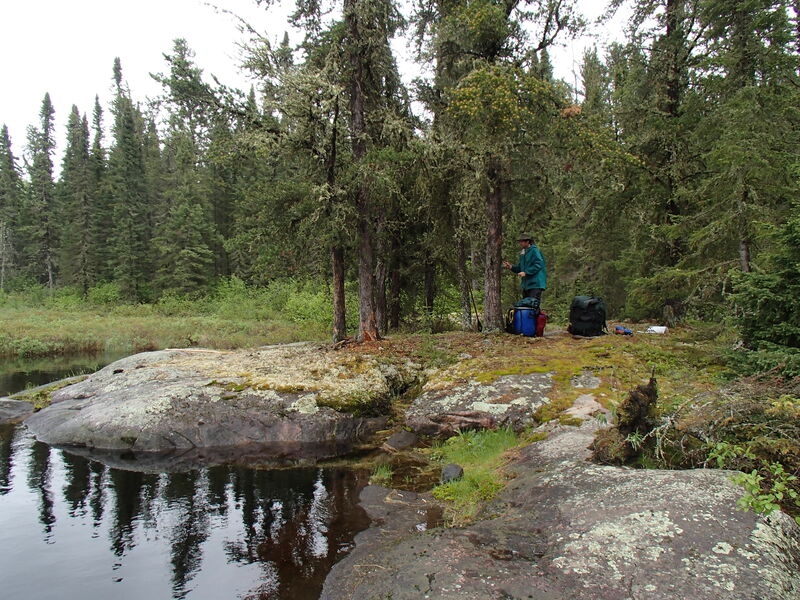 The campsite was next to a beautiful rapid, but the kitchen area was a low wet bug hole. 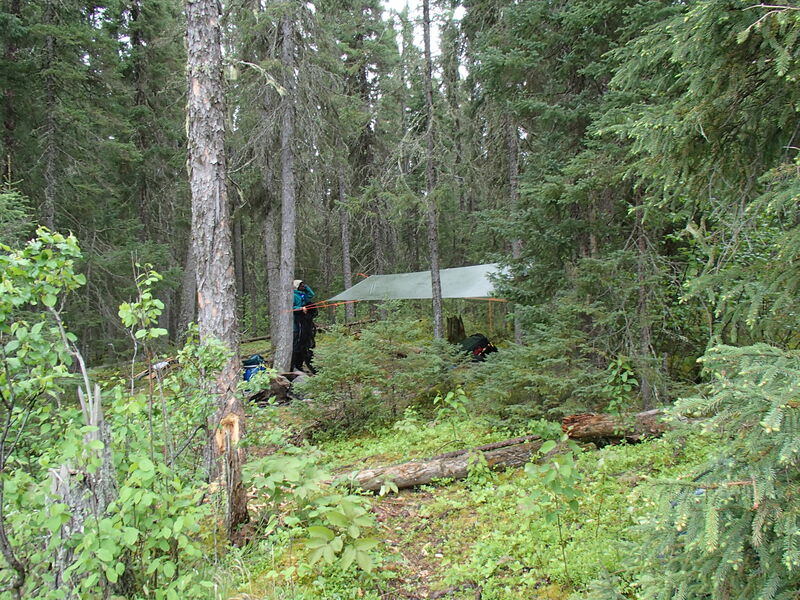 We made good use of our bug shelter and shirts, and sat under the tarp for much of the night. The rain stopped right before dinner for just long enough for us to get a fire going, only to start up again and rain fairly heavily. 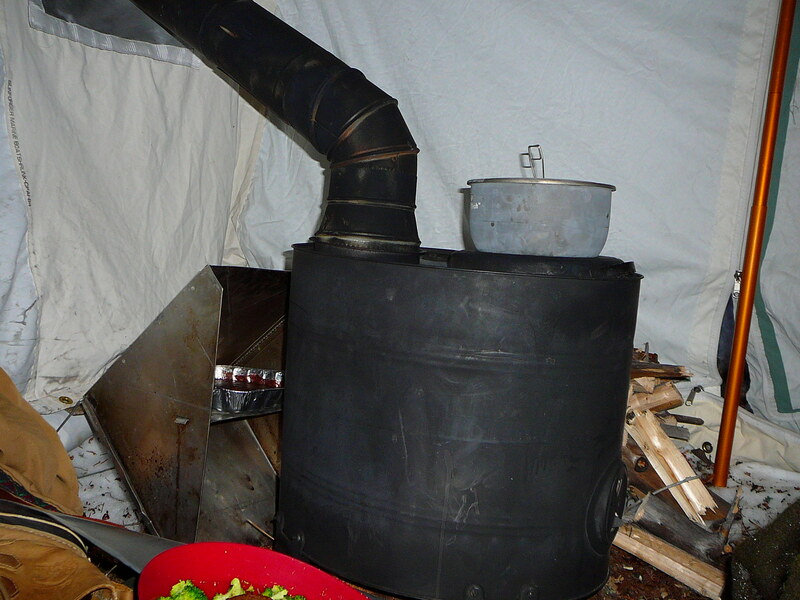 Our fire put up a good fight, but eventually went out, and the camp stove was fired up. Our last day we woke up to a light rain, and decided to wait a bit to see if it would stop. We lucked out and had on and off rain at near perfect intervals. We left the tent and packed up without rain, ate breakfast under the tarp while it rained; only to have it stop again for the rest of the day once we set off. 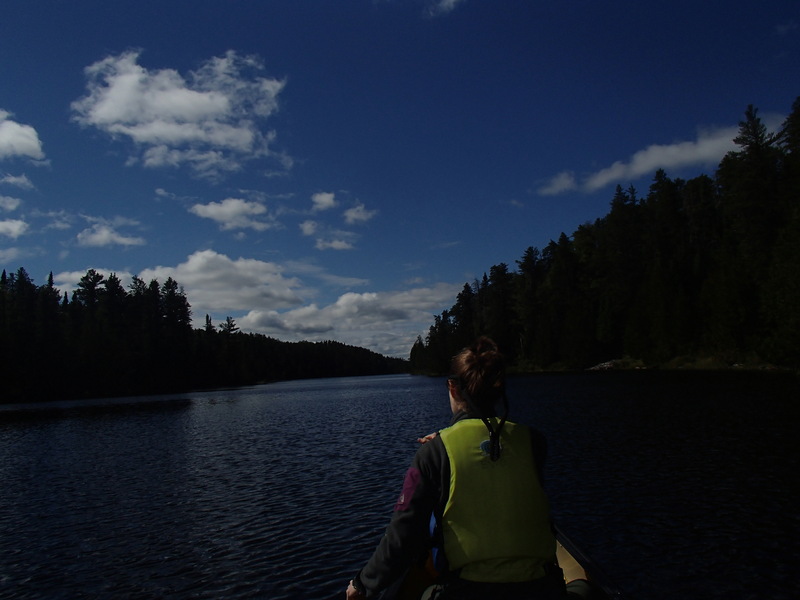 We paddled for a few hours down the remainder of the Otoskwin and Mud lake to our take out point. We found my truck safe and sound, and had a nice conversation with a guy who lives on the lake every summer. 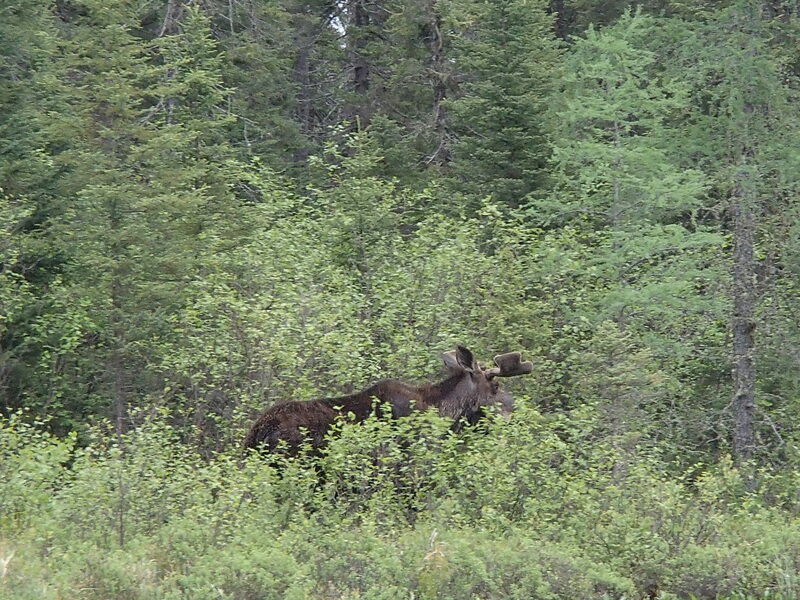 Although he wasn’t there when we dropped off my truck, he had obviously been keeping a eye on it while we were paddling. 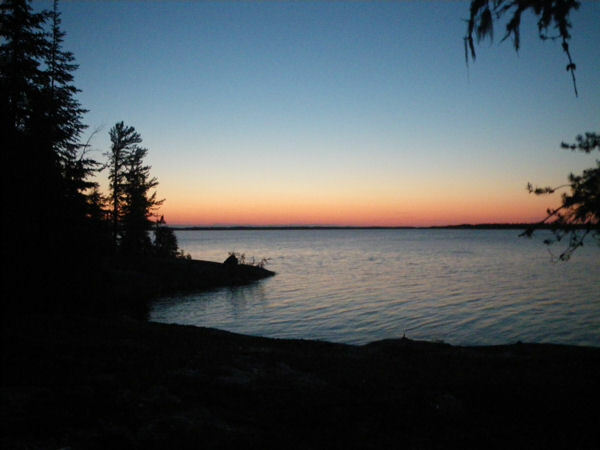 We drove back to Pickle lake and then continued to Upsala, where we stopped for the night. 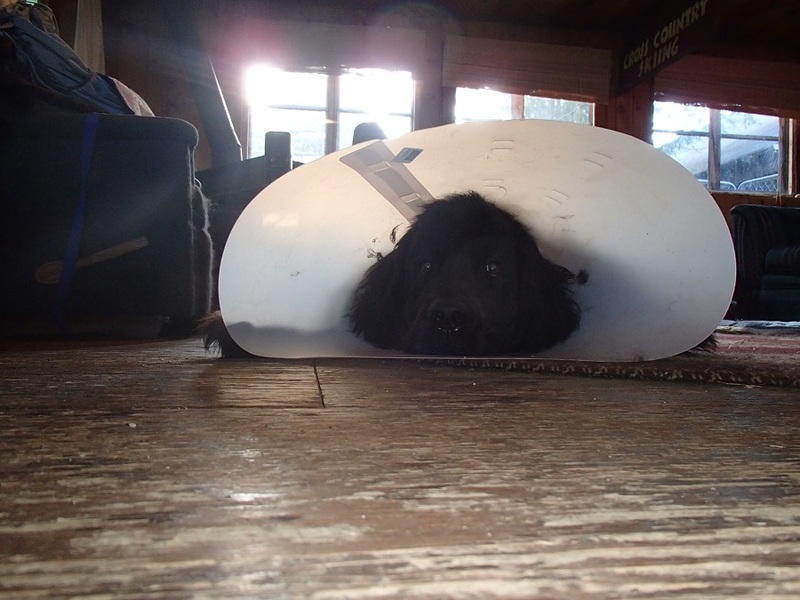 The next day we ran some errands in Thunder Bay and returned home. 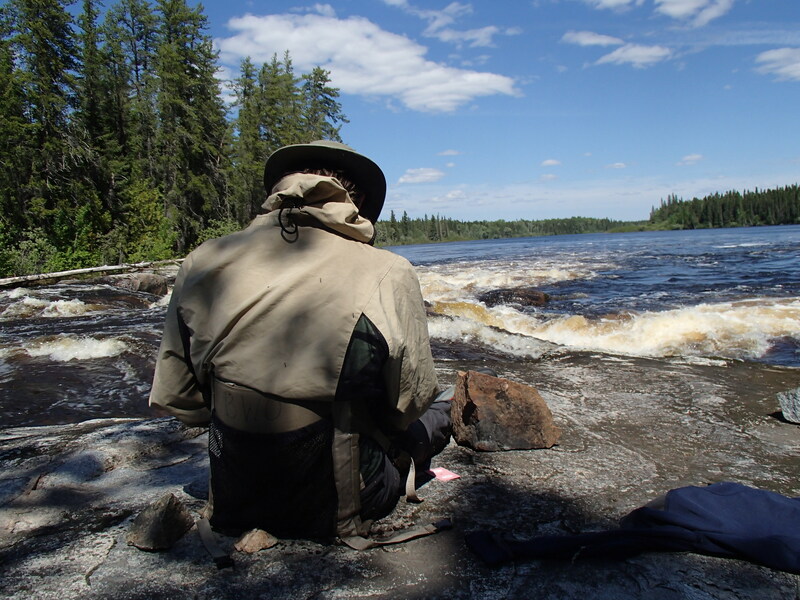 Overall it was a great trip with perfect weather, and a nice mix of lakes and rivers. 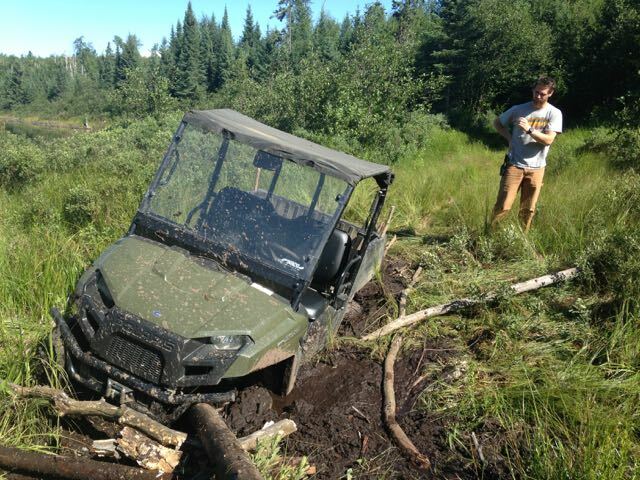 I expect we will be returning to the pickle lake area sooner rather than later. 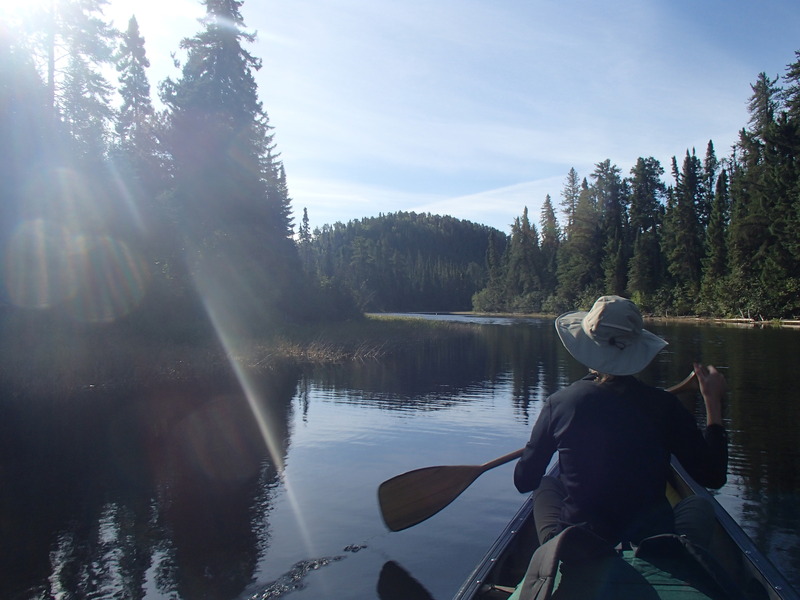 This spring Kate and I took a canoe trip in the Nakina, Ontario region. 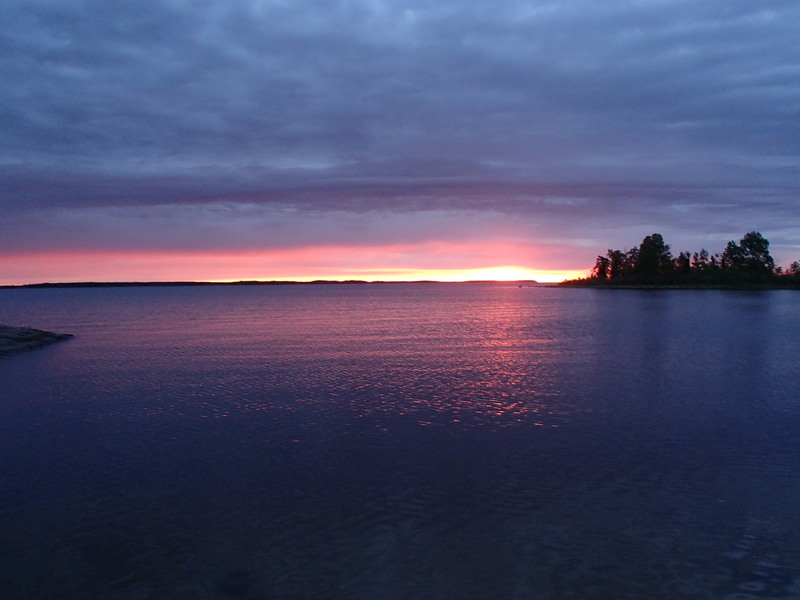 The Nakina region is about 300 miles north of Grand Marais, and is known for its world class fishing, and abundant wildlife. 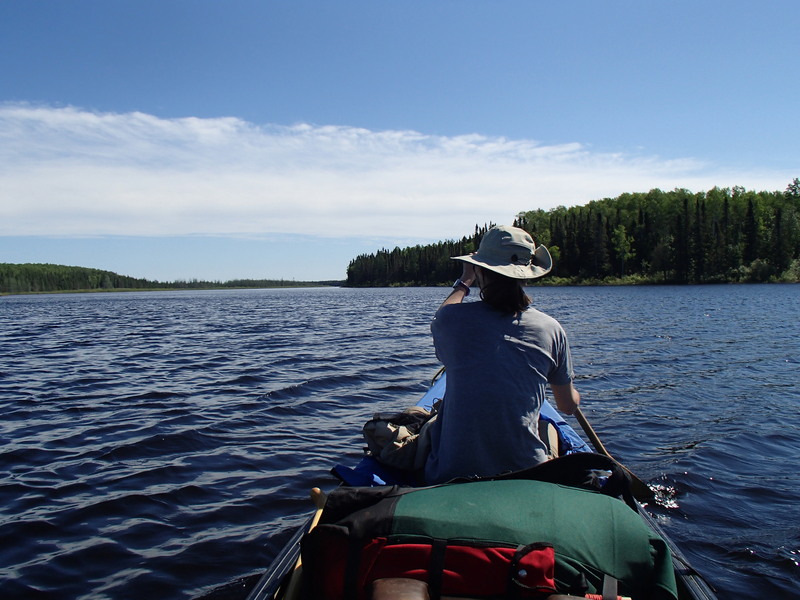 The area is not a well-known paddling destination, but should be, offering a huge number of wilderness routes. For the first three days of our trip, we were plagued with bad weather, it rained constantly (unless it snowed), the highs were around or below 50, and the lows about freezing. We stayed mostly dry, but it was harder to enjoy our surroundings. On the fourth day the sun came out, and the next three days were perfect, if not a bit too sunny. 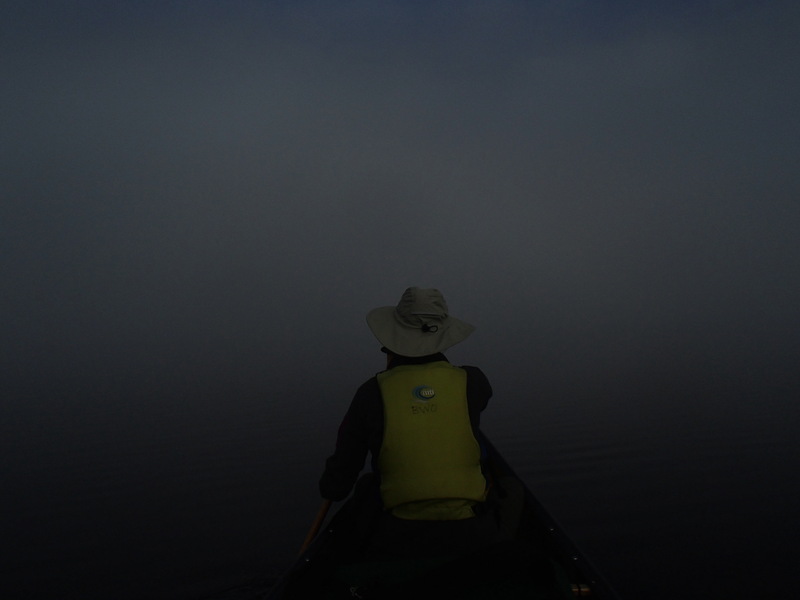 We finished in an on and off light mist on our seventh day. 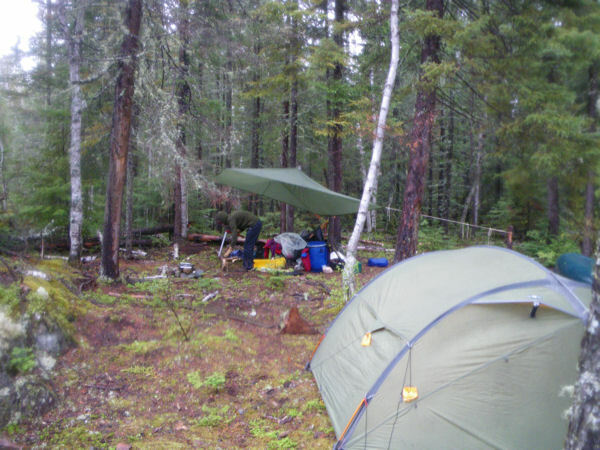 Our first camp. 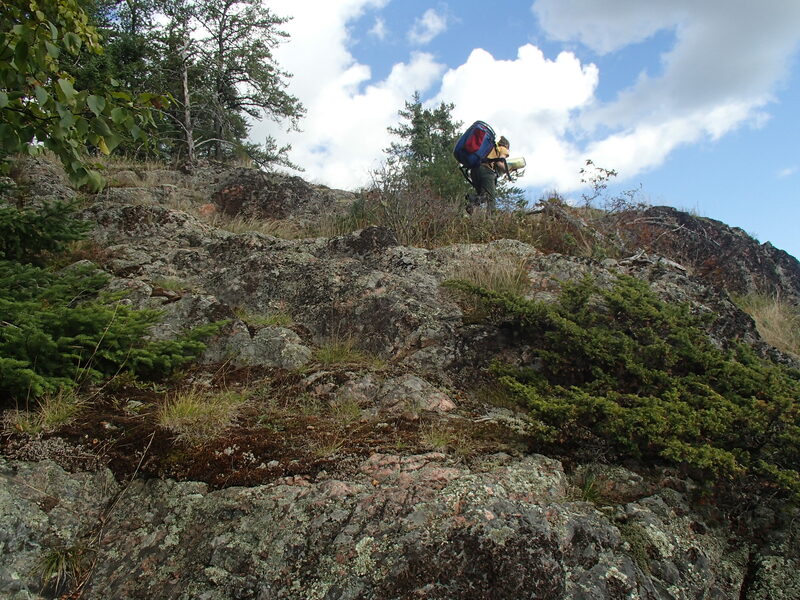 It was a bit cold and windy to enjoy the nice open area provided by the sloping rock. Summit lake on our second day. 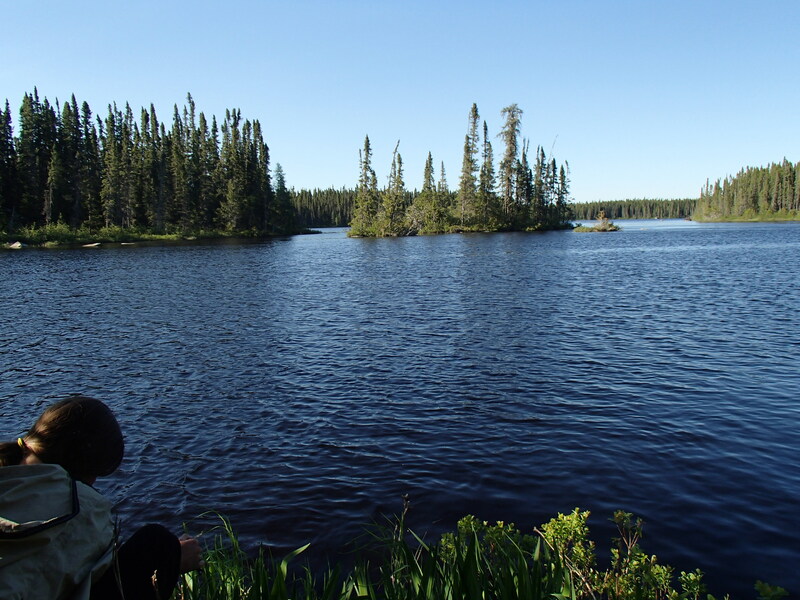 Summit lake is interesting because the lake itself sits on the height of land, with outlets flowing both south to Superior, and north the the James Bay drainage. This interesting fact does not make it any more enjoyable to paddle in a gale. Our second day ended at the falls on the Powitick river. We were delayed for much of the day waiting out lighting. Along the way we ran some fun rapids and saw three moose. Day three on the Kap river. 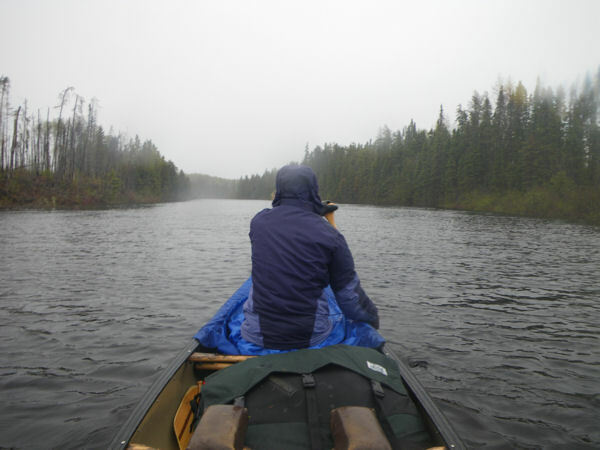 We paddled more fun and challenging rapids, all in the same cold, wet weather. Once we started heading east, the wind became very strong against us. We pulled over and made a rough camp on shore. 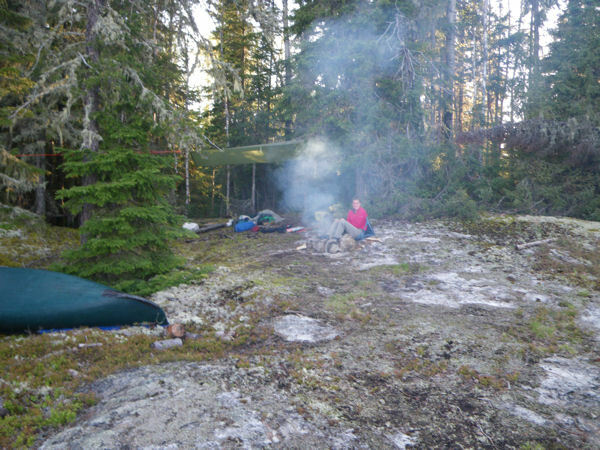 After a quick supper, we crawled into our tent and dry sleeping bags for the night. Day four was hopeful looking. Kate starts to lose some layers by taking down her hood. 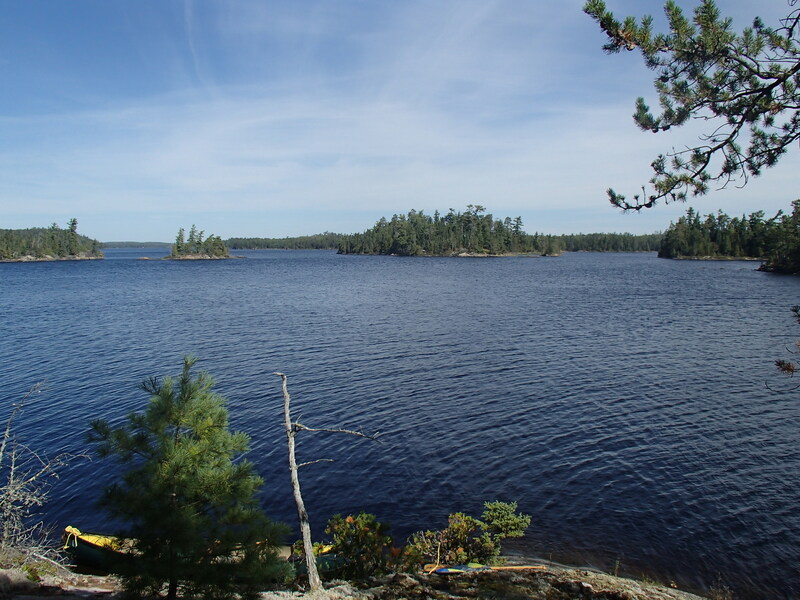 Rocks on Stewart lake, the first of a series of large lakes. 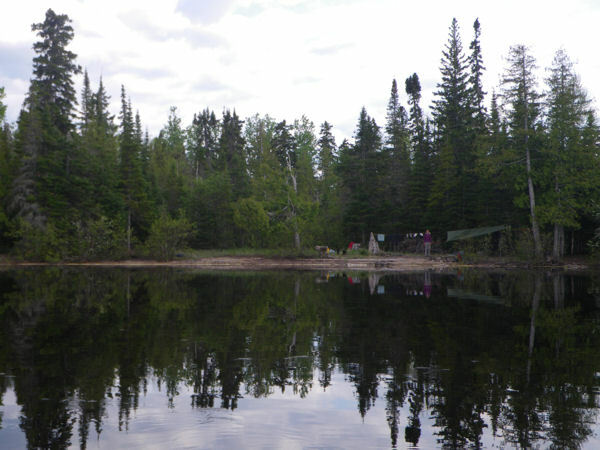 These lakes had fly in fishing camps on them, and because of them we saw more people than our first three days (none). 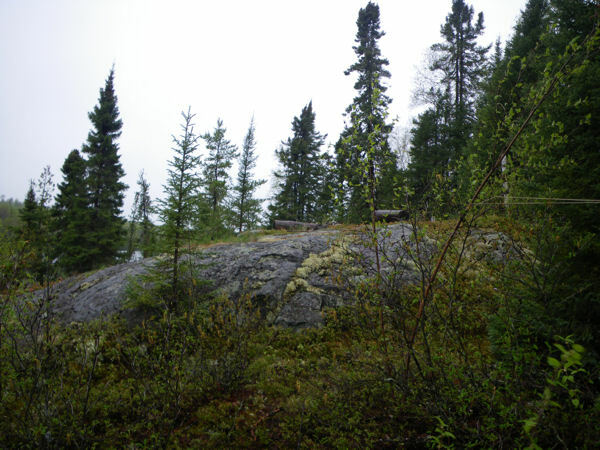 The site on Stone Lake. 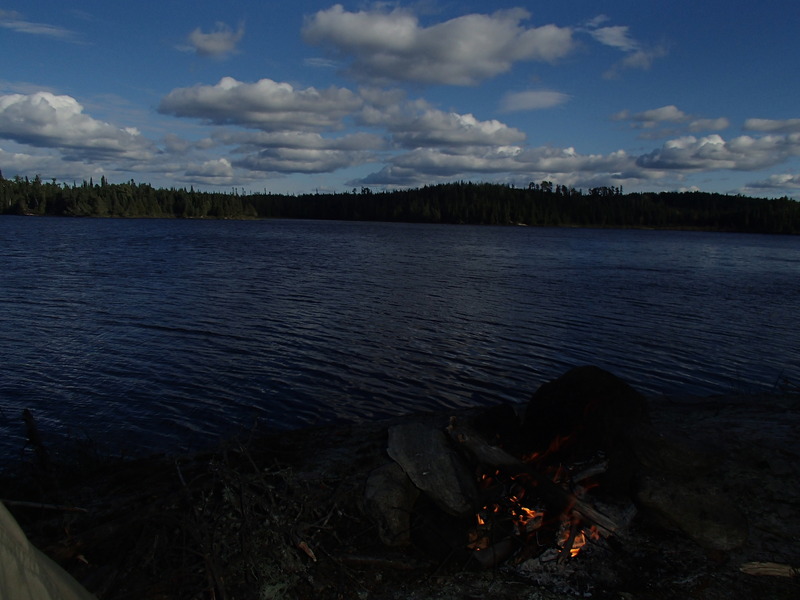 This might be the nicest place I’ve camped. Perfect site for the time, the sloping rocks let us dry out some wet gear. Stone lake in the morning. 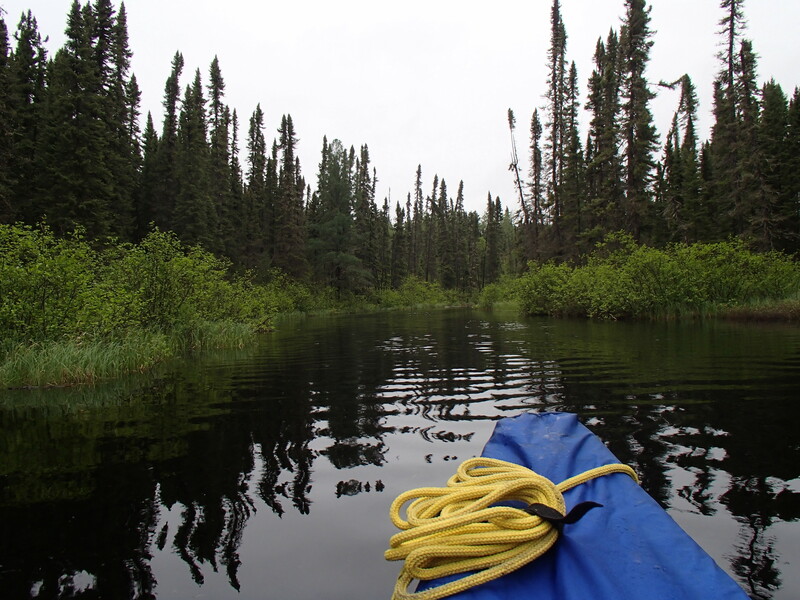 On day five we had a mile long portage through a swamp, and then a big open water crossing on Ara lake. I woke up early to see what the wind was doing. We decided to leave at our normal time, and had no issues with the wind. Ara lake. This lake seemed huge. Meta Lake. By the time we were on Meta the winds were starting to kick up. 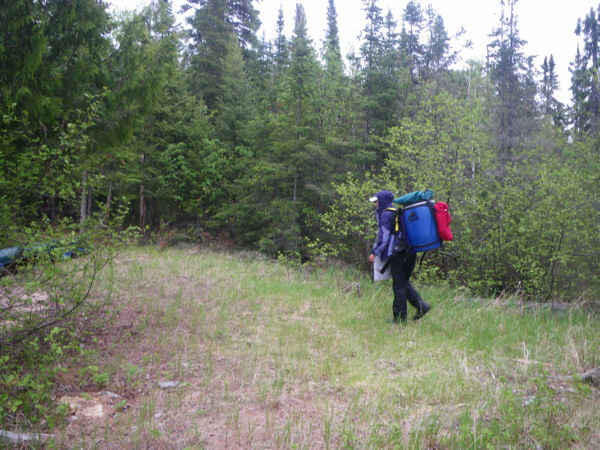 I had been warned about the Portage from Meta to Abamasagi. 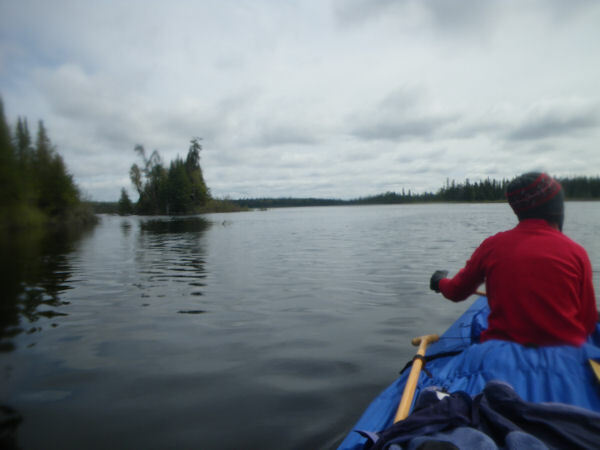 The person who had helped me plan the trip and did our shuttle had said it was the one portage he swore he would never do again (although he has since reportedly been over it this year). 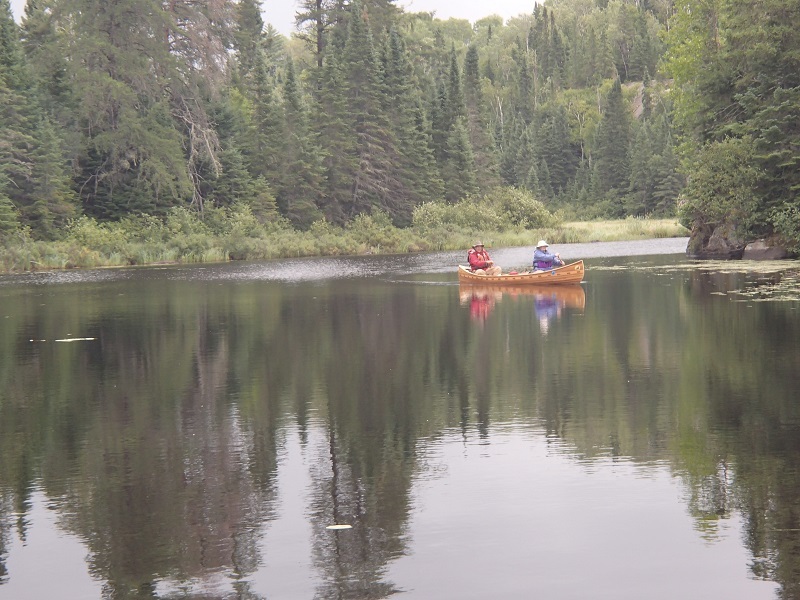 When we went over it, the water was so high I could float the canoe through much of it. Abamasagi Lake. The wind was really coming up behind us. 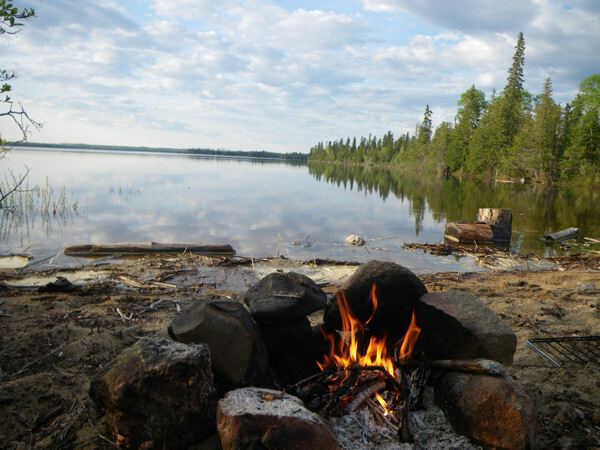 The next day we decided to take it easy and only move a few miles down the lake to a beach site marked on my map. 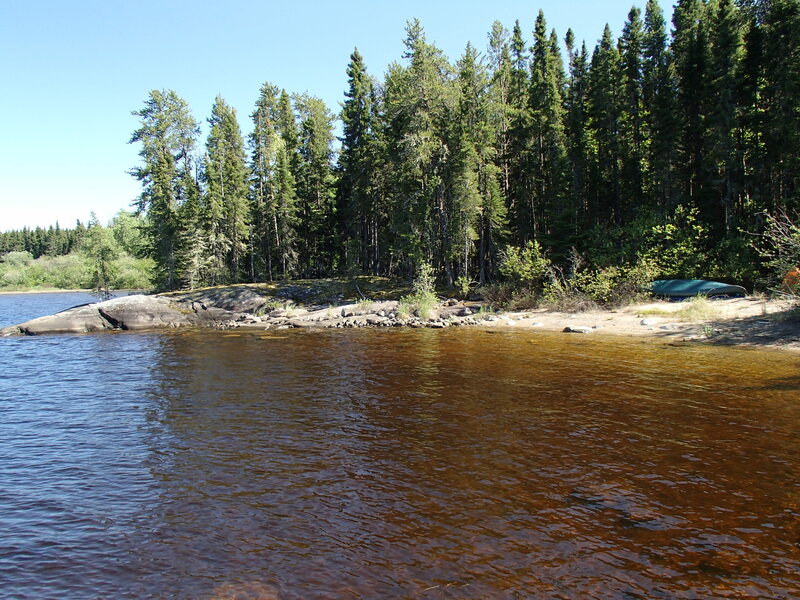 The water was so high that much of the beach was under water, as well as the fire ring. Our beach site from the lake. We moved the fire ring to above water. The morning of our seventh day, packing up. 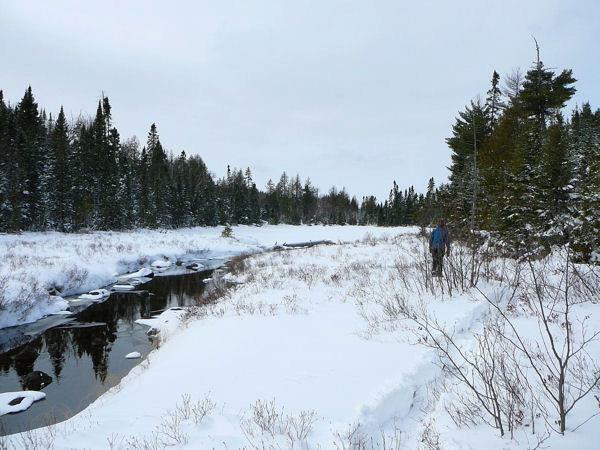 Final few miles on the Kowkash river. Shortly before this photo we ran a drop that in hindsight might not have been wise. We had a good clear V, but once we were in the rapids it became clear how big the wave train was. Kate spent much of the run too high in the air to paddle. Our cover was the only reason we didn’t swamp. Overall it was a good trip. 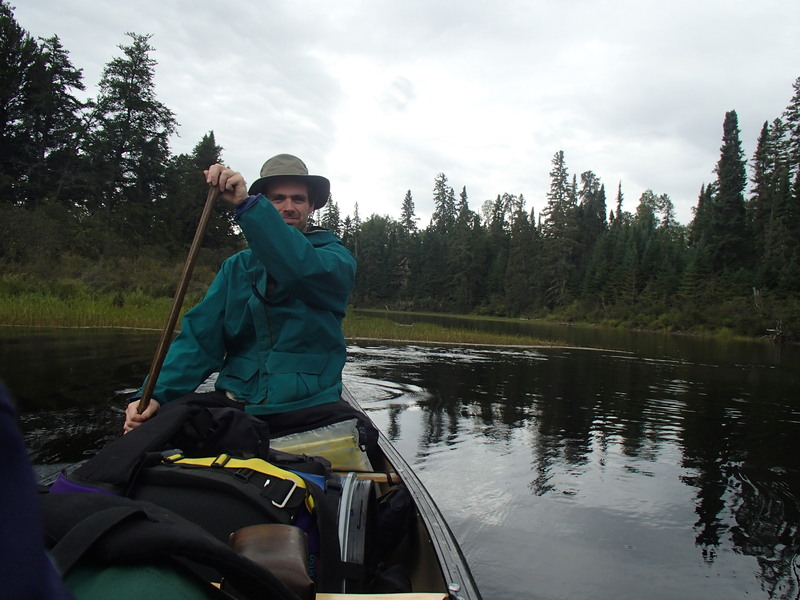 We paddled a new interesting area, and had the full range of weather. 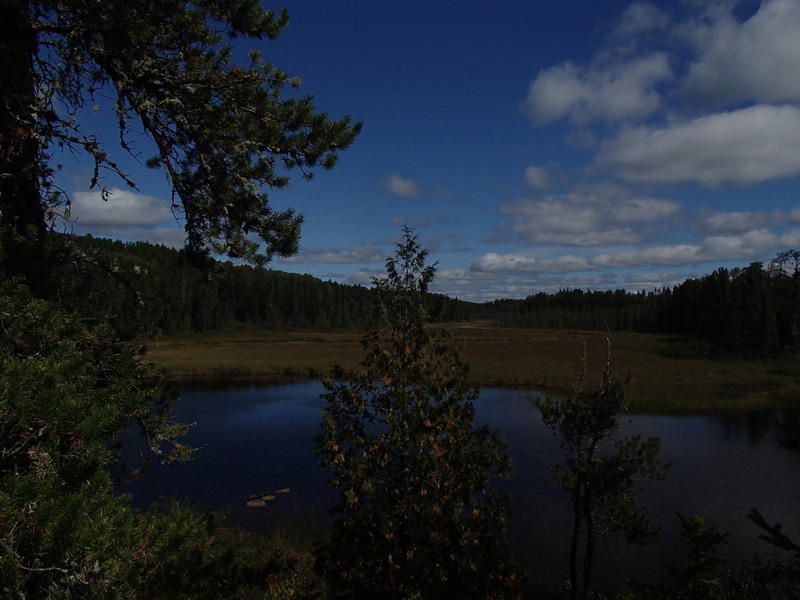 We saw great wildlife, including eight moose and a woodland caribou. I was able to catch fish, which means fishing must have been excellent. 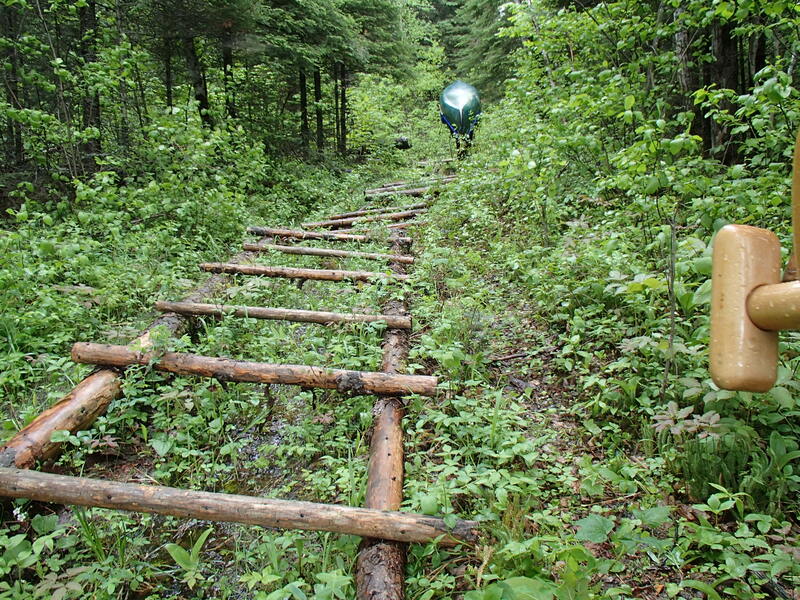 I hope to return to the area again to explore more of the routes the Nakina region has to offer, and would be happy to share the information I have gathered to anyone interested in a trip in this area. 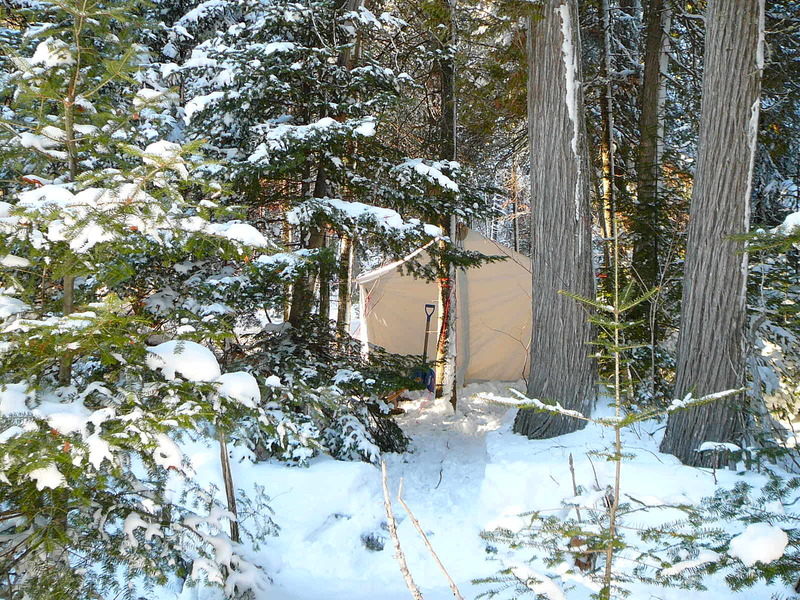 A good starting point for planning a trip in the area is http://www.greenstonewildernesstrails.ca under the “trails” section. 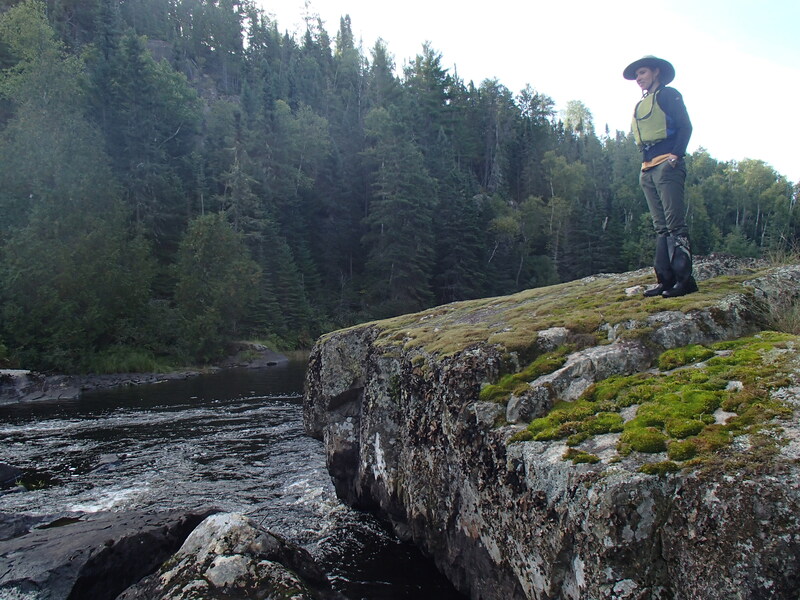 The site has info for many routes, including the Steel river, which Kate and I paddled last year. 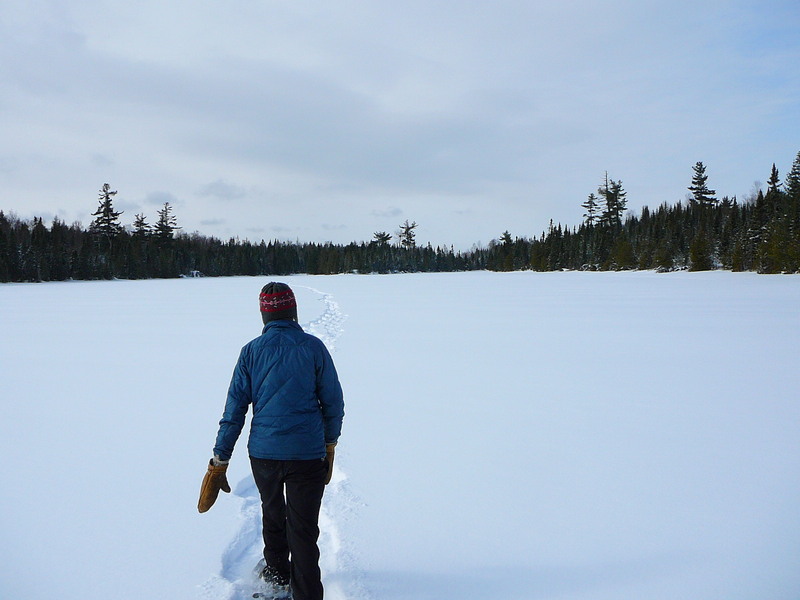 Kate and I recently took a four-day trip to One Island Lake. 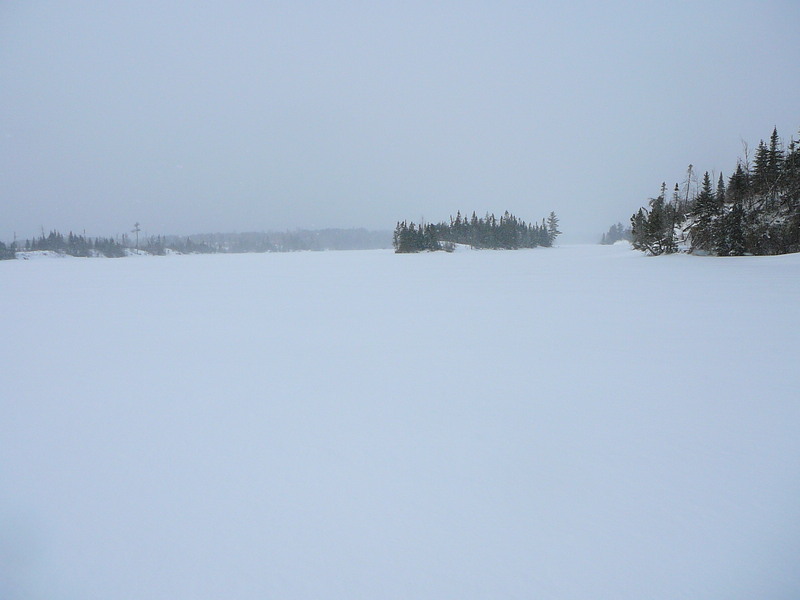 Rush Lake had been our intended target, but due to the 12-15″ of snow we received in the two days prior to our trip, we decided to stop one lake short. In the end this was a blessing, as we found a very nice sheltered site that protected us from the wild winds we saw on day three. We don’t have any photos from our trip in, as it was hard going and documenting it was far from my mind. Cooking at night. Brownies in the oven in back.